Born in Sioux Falls SD and raised in Minneapolis MN, Wexler served in the Navy during WWII and graduated from the University of Minnesota in 1950. 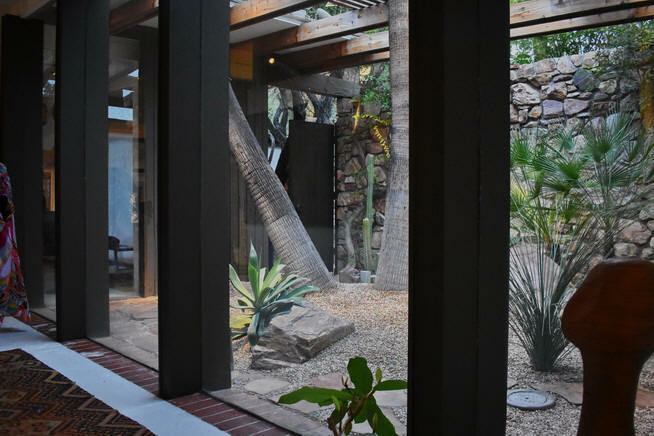 He moved to Los Angeles to work for Richard Neutra then moved to Palm Springs in 1952 to work for William Cody. 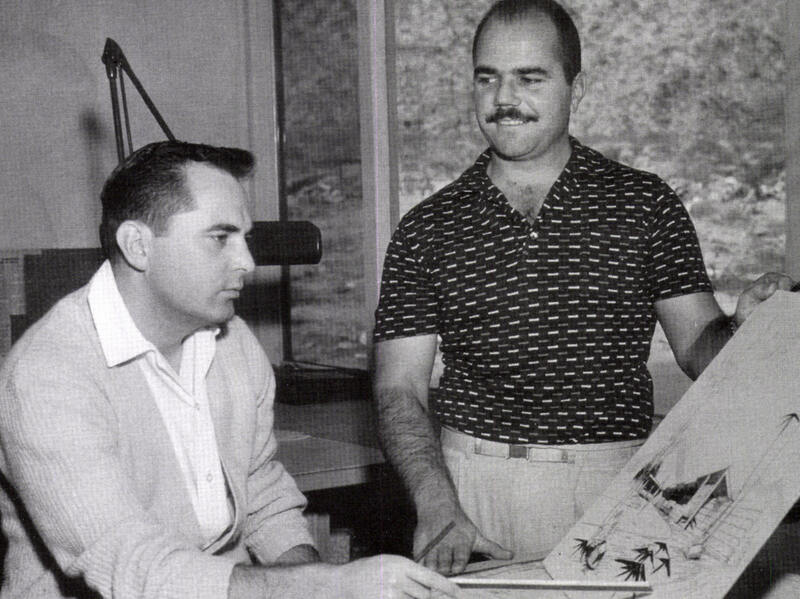 In 1952, Wexler, along with Richard Harrison from Cody’s firm, set up Wexler & Harrison, photo above. 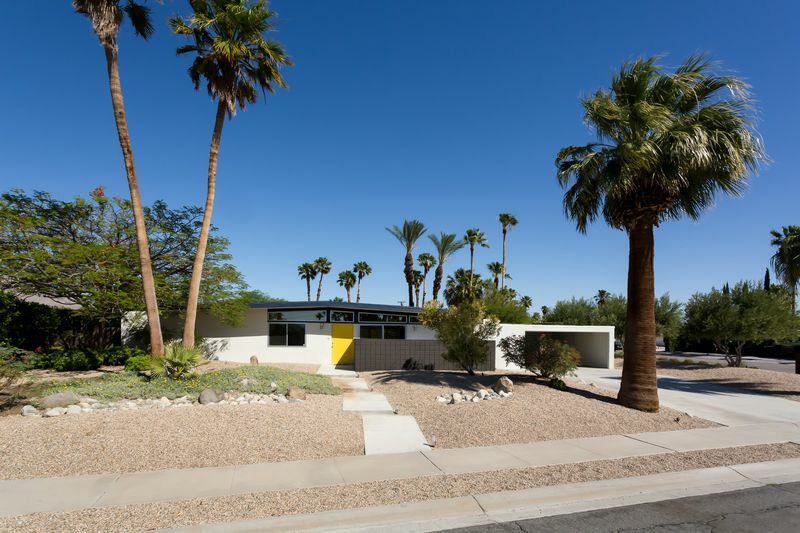 In 1960, the George Alexander Construction Company hired them to design an innovative neighborhood of all-steel homes in north Palm Springs. Due to high steel costs, the project was halted after just seven homes were built. These prefabs became internationally acclaimed. That partnership dissolved amicably in 1961 and Wexler went on his own. 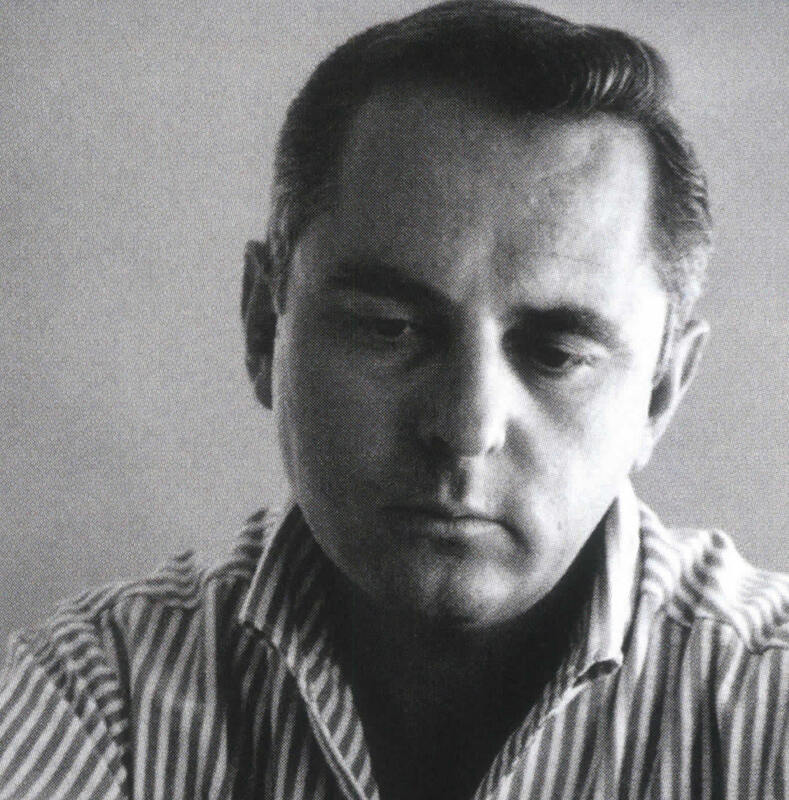 At the same time, he owned Wexler and Perrin-Boggio Architects and Engineers. From 1969 to 2000 he was back on his own. WWCOT (Widom, Wein, Cohen, O'Leary, and Terasawa) acquired Wexler's firm in 2000. 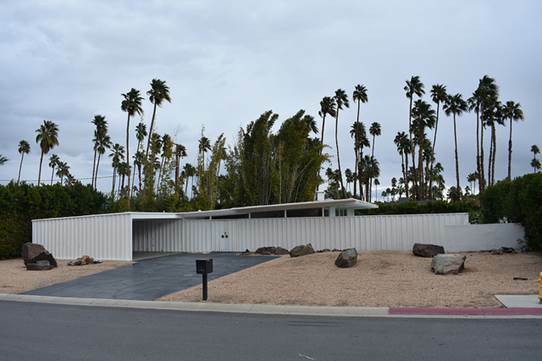 Wexler practiced in Palm Springs for almost six decades with a body of work that included houses, schools, hotels, banks and the Palm Springs International Airport. 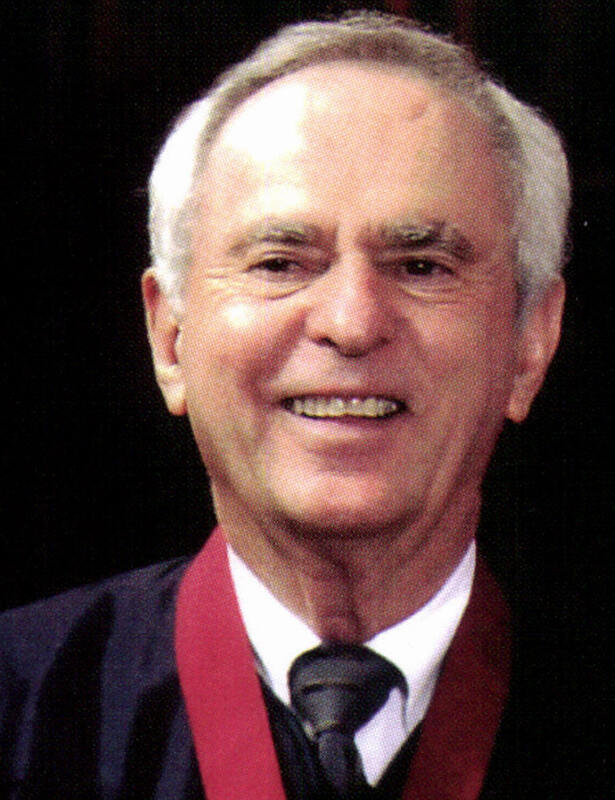 He was one of the first architects to building an entire house subdivision out of steel framing. His archives are at the Cal Poly Pomona College of Environmental Design. He was honored on the Palm Springs Walk of Stars in 2008. 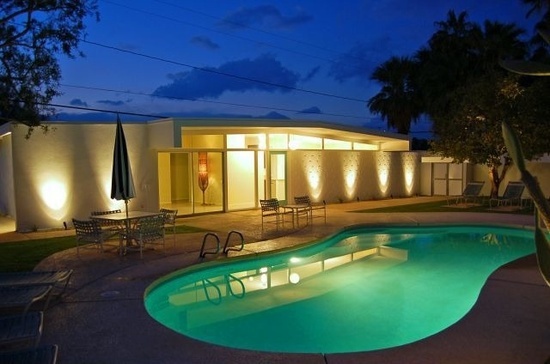 1954 - The Joe and Joyce Pawling House I, aka Lilliana Gardens, 230 Lilliana Drive, Palm Springs CA. BW photo by Dan Shavkin. Sold to 2016 Marduk (Duke) A. and Zsuzsi Sayad. 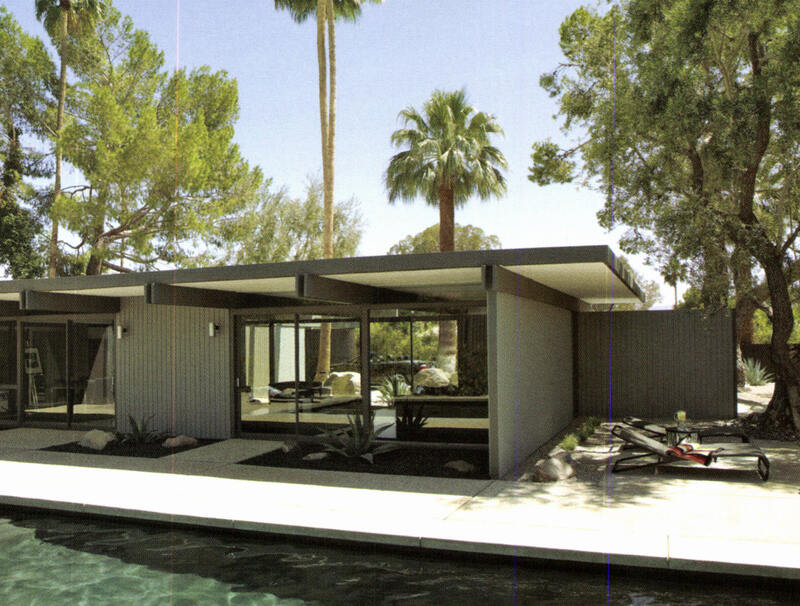 1954 - The Joe and Joyce Pawfling House II, aka Lilliana Gardens, 231 Lilliana Drive, Palm Springs CA. Designed with Richard Harrision. 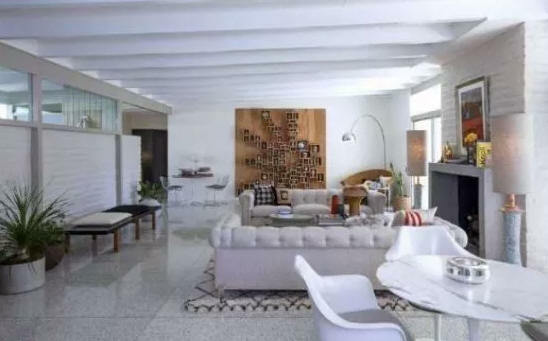 Interior design by Arthur Elrod. Sold to Rosemarie Vacano. 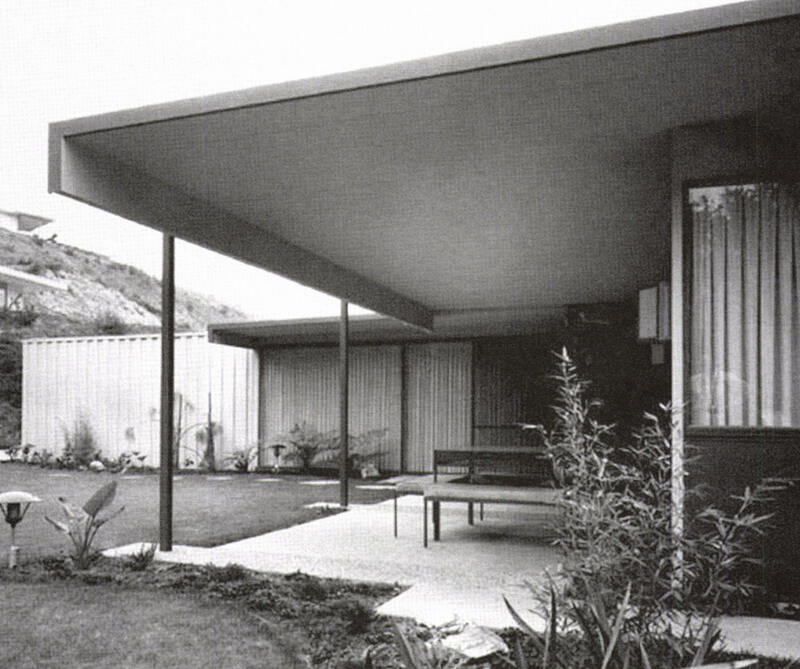 1954 - The Robert (Bob) Howard and Andrea Leeds House I, aka Leeds-Howard House I, 515 Via Lola, Palm Springs CA. 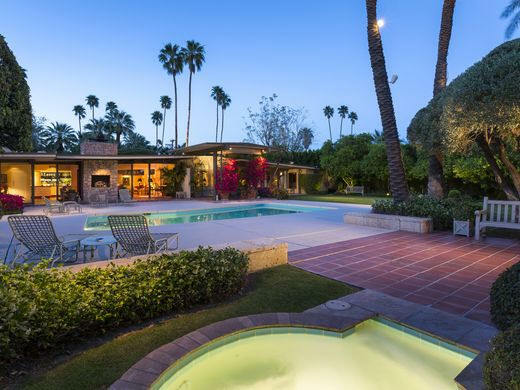 Sold around 1956 to Kirk and Anne Douglas. 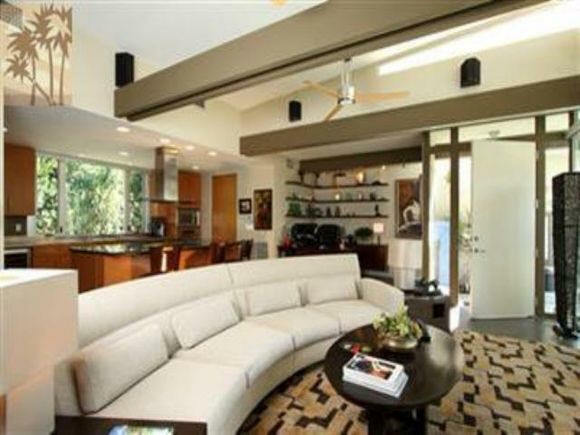 Douglas expanded the living area around 1976 to add a formal dining room. Kitchen remodeled in 1980. Sold in 1999 to Todd Jenkins and Timothy Dietrich. 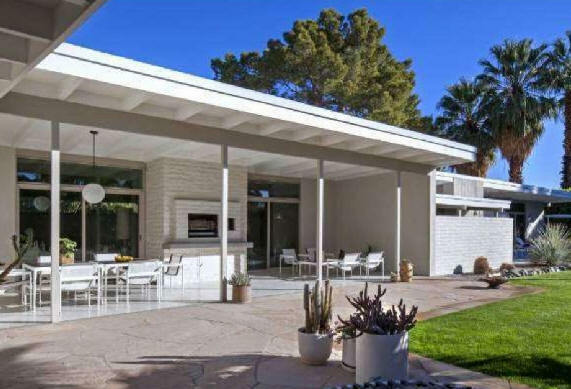 Sold in 2016 to Michael Budman and architect Diane Bald. Bottom three photos by Michael Locke. According to the Desert Sun,"Katharine Hepburn and Spencer Tracy carried on an affair there. Frank Sinatra occasionally cooked meals in the kitchen. 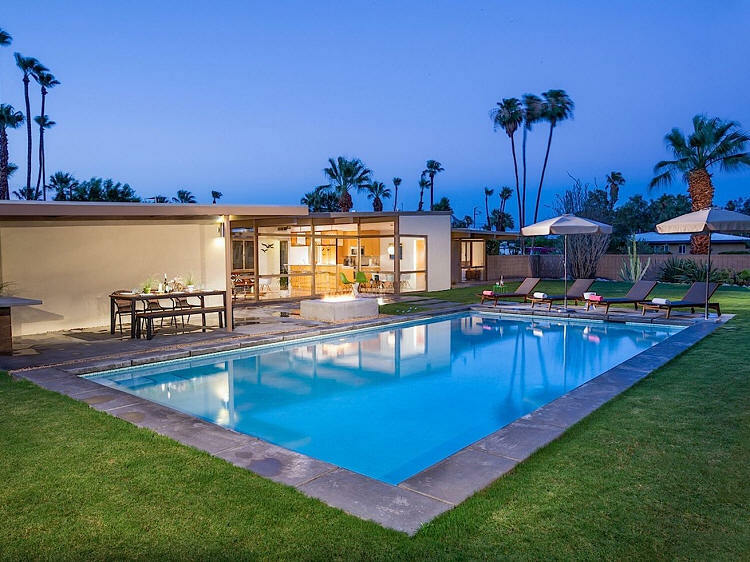 And when the house behind it belonged to Dinah Shore, the families installed a gate between their properties so they and their guests could travel back and forth." 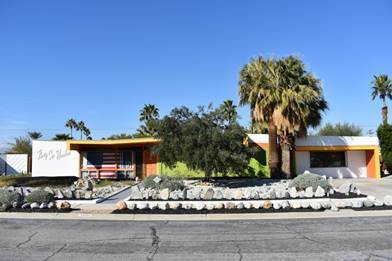 1955 - The Donald and Lynn Wexler House, 1272 East Verbena Drive, Palm Springs CA. Wexler did additions in 1965 and 2007. Sold several times, including to Alice Alioto and Daniel Giles. Restoration by architect Lance O'Donnell. Sold in 2016 to Joe Mantello. 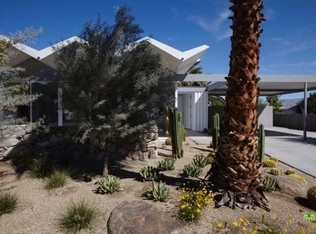 1955 - The William Boggess House, 1366 Calle de Maria, Palm Springs CA. Designed with Richard Harrison. Built by Joe Pawling. Featured in LA Times Home, January 1, 1956. Photo by Michael Locke. 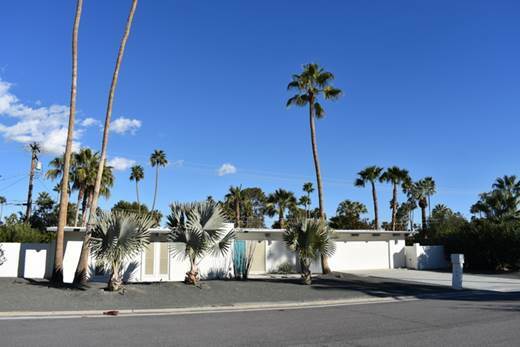 1955 - 2821 East Livmor Avenue, Palm Springs CA. 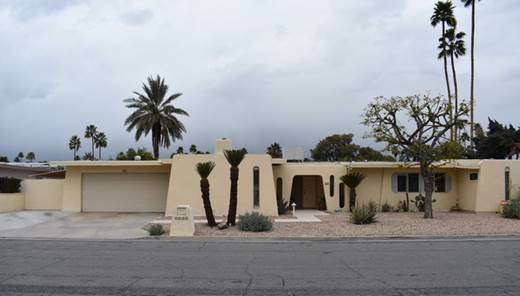 One of a handful of Wexler and Harrison homes in the orginal Sunmor Tract developed by Bob Higgins. Renovated in 2015. For sale in 2019. Photos by Desanti Photo. 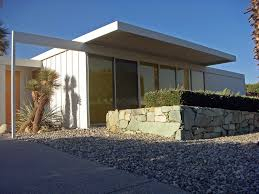 1957 - The Maurice Smith House, 332 West Pablo Drive, Palm Springs CA. Sold to William and Lillian A. Pfisterer. 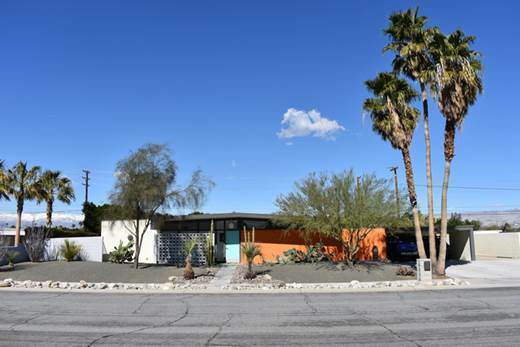 1957 - The Ted Leff House, aka the Leff/Florsheim House, 362 West Via Sol, Palm Springs CA. Sold to Harold Florsheim. Sold to Armstrong. Sold in 2016 to Eric Carlson and Jonathan Eaton. Top photo by Dan Chavkin. 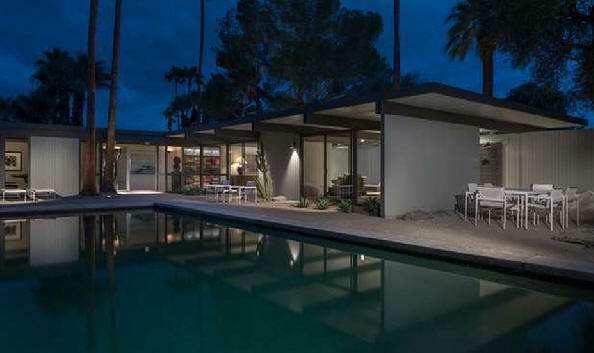 1957 - The Sydney and Rachel Charney House, 37-127 Marx Circle, Tamarisk Country Club, Rancho Mirage CA. Designed with Richard Harrison. Interiors by Arthur Elrod. Landscape design by Garrett Eckbo. 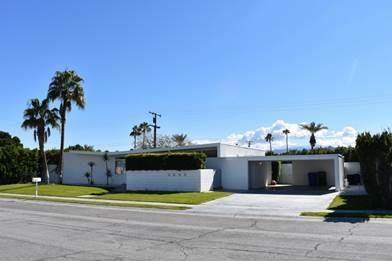 1958 - The Royal Air Properties Luxury Apartments, 389 West Tahquitz Drive, Palm Springs CA. Designed with Richard Harrison. Interiors by Arthur Elrod. The first apartment went up in March 1957. Destroyed. 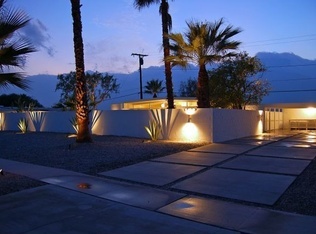 1958 - Wladziu Valentino "Lee" Liberace House, 231 Lyn Circle, Palm Springs CA.Designed with Richard Harrison. 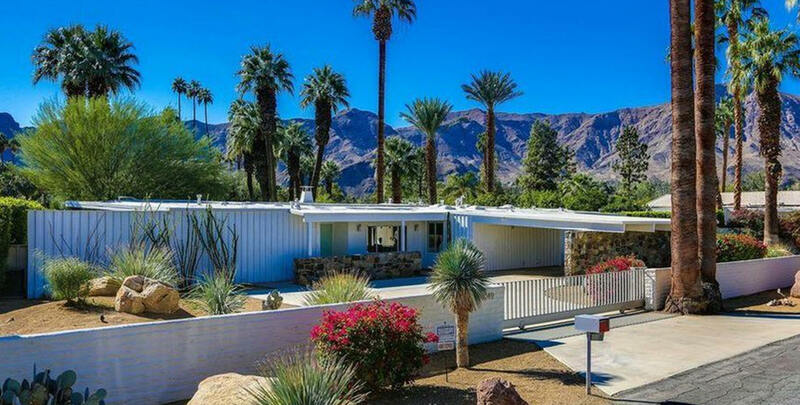 Flamboyant pianist and entertainer owned four houses in Palm Springs including this one, which he used as a guest house. Liberace, who's real name was Wladziu Valentino "Lee" Liberace, had the swimming pool fashioned in the shape of a grand piano. Sold in 2016 to Michael Valle. Photo by Michael Locke. 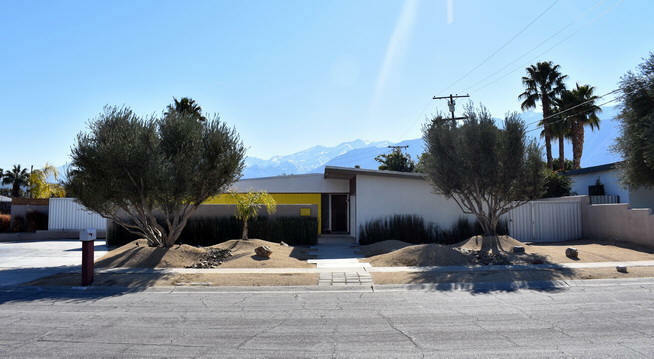 1958 – 204 North Orchard Tree Lane, Palm Springs CA. Designed with Richard Harrison. Developed by George Alexander as part of the Enchanted Homes-Sunmor Estates subdivision. Photo by Michael Locke. 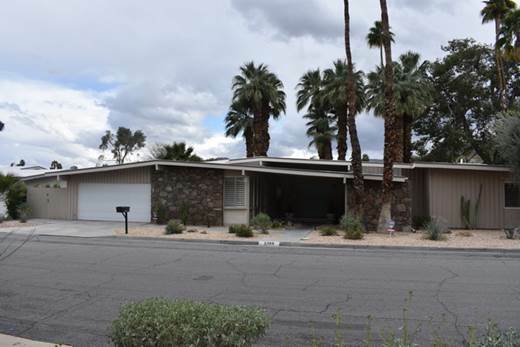 1958 – 212 North Sunset Way, Palm Springs CA. Designed with Richard Harrison. Developed by George Alexander as part of the Enchanted Homes-Sunmor Estates subdivision. Photo by Michael Locke. 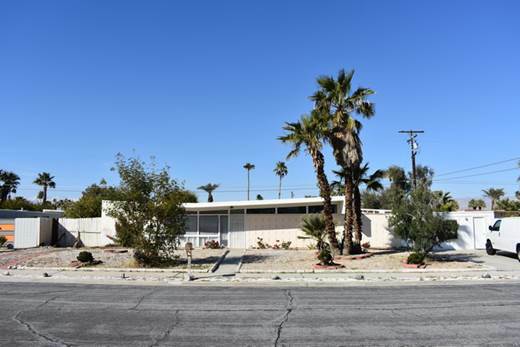 1958 – 216 North Monterey Road, Palm Springs CA. Designed with Richard Harrison. Developed by George Alexander as part of the Enchanted Homes-Sunmor Estates subdivision. Photo by Michael Locke. 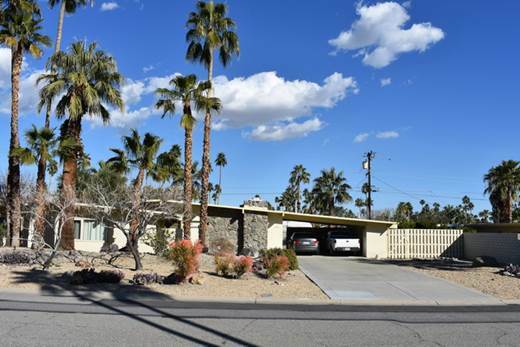 1958 – 218 North Orchard Tree Lane, Palm Springs CA. Designed with Richard Harrison. Developed by George Alexander as part of the Enchanted Homes-Sunmor Estates subdivision. Photo by Michael Locke. 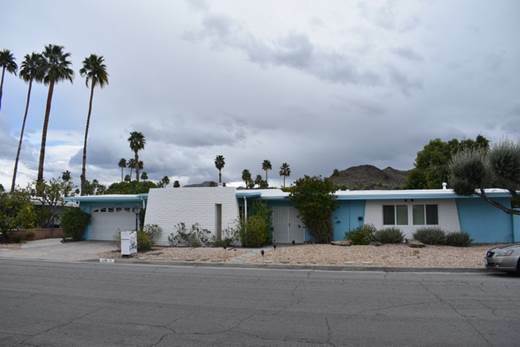 1958 – 220 North Burton Way, Palm Springs CA. Designed with Richard Harrison. Developed by George Alexander as part of the Enchanted Homes-Sunmor Estates subdivision. Photo by Michael Locke. 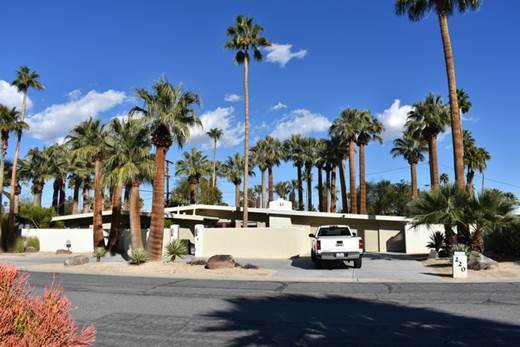 1958 – 225 North Orchard Tree Lane, Palm Springs CA. Designed with Richard Harrison. Developed by George Alexander as part of the Enchanted Homes-Sunmor Estates subdivision. Photo by Michael Locke. 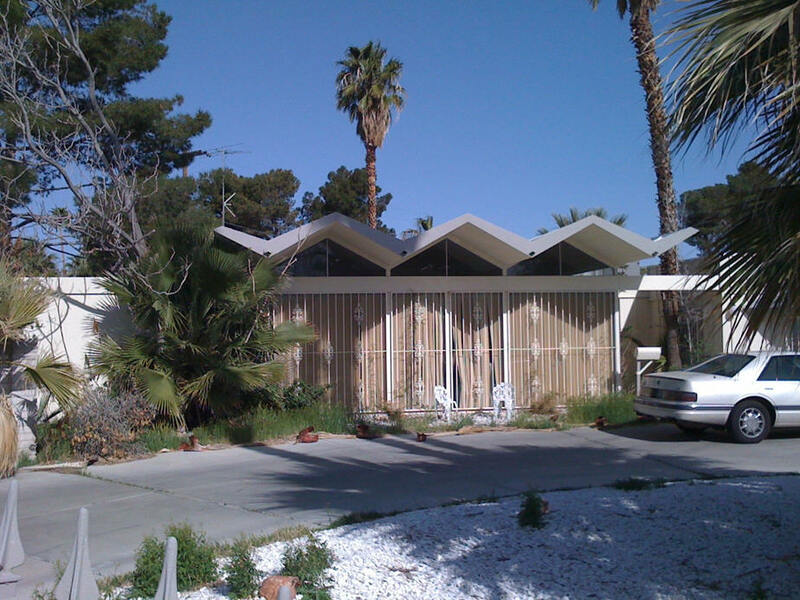 1958 – Huell Houser House, 247 North Monterey Road, Palm Springs CA. Designed with Richard Harrison. Developed by George Alexander as part of the Enchanted Homes-Sunmor Estates subdivision. Television personality Huell Howser (1945-2013), best known for hosting the long-running PBS show California Gold purchased the house in 2000. 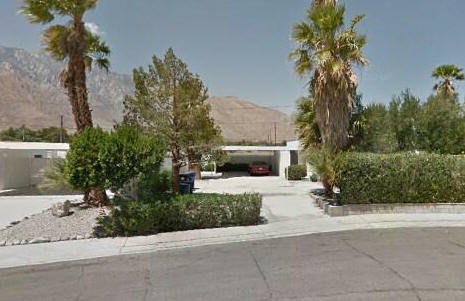 1958 – 233 North Farrell Drive, Palm Springs CA. Developed by the George Alexander Construction Company as part of Sunmor Estates/Enchanted Homes subdivision. Photo by Michael Locke. 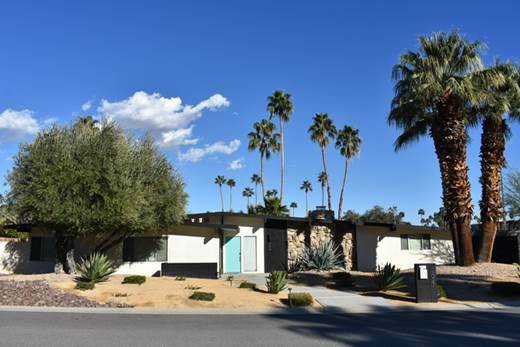 1958 – 250 North Burton Way, Palm Springs CA. Designed with Richard Harrison. Developed by George Alexander as part of the Enchanted Homes-Sunmor Estates subdivision. Photo by Michael Locke. 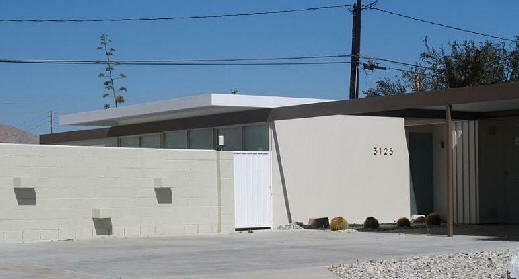 1958 – 266 North Monterey Road, Palm Springs CA. Designed with Richard Harrison. Developed by George Alexander as part of the Enchanted Homes-Sunmor Estates subdivision. Photo by Michael Locke. 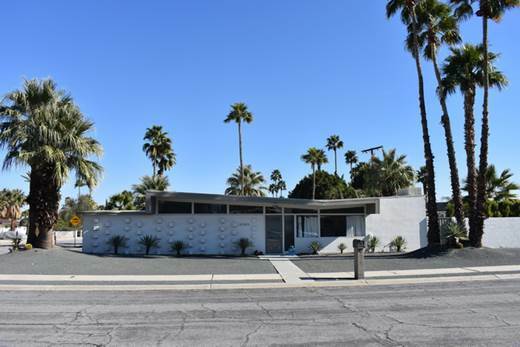 1958 – 267 North Burton Way, Palm Springs CA. Designed with Richard Harrison. Developed by George Alexander as part of the Enchanted Homes-Sunmor Estates subdivision. Photo by Michael Locke. 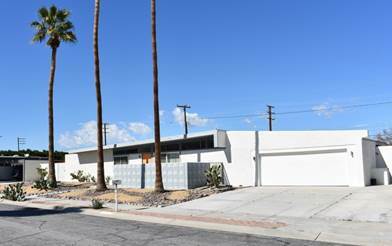 1958 – 278 North Sunset Way, Palm Springs CA. Designed with Richard Harrison. Developed by George Alexander as part of the Enchanted Homes-Sunmor Estates subdivision. Photo by Michael Locke. 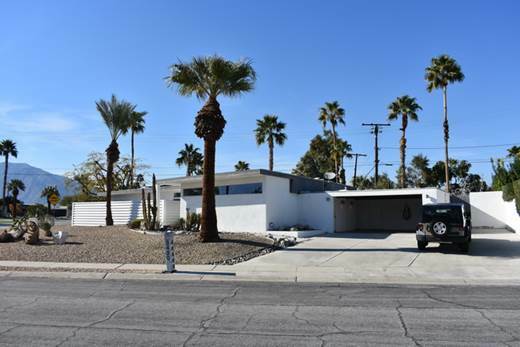 1958 – 287 North Burton Way, Palm Springs CA. Designed with Richard Harrison. Developed by George Alexander as part of the Enchanted Homes-Sunmor Estates subdivision. Photo by Michael Locke. 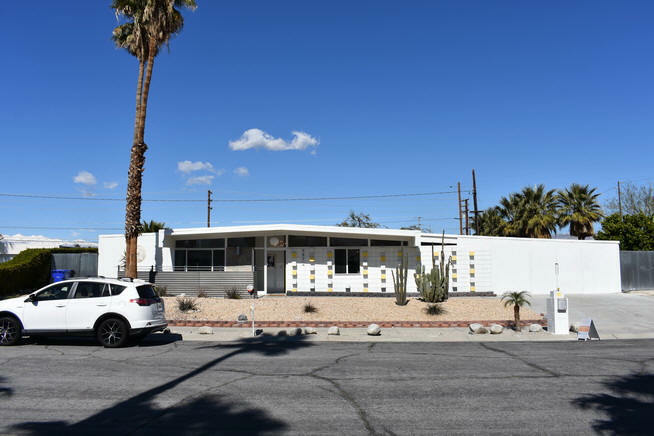 1958 - 1366 Calle Rolph, Palm Springs CA. Sold in 1989 to Jerry and Jolene Hill. 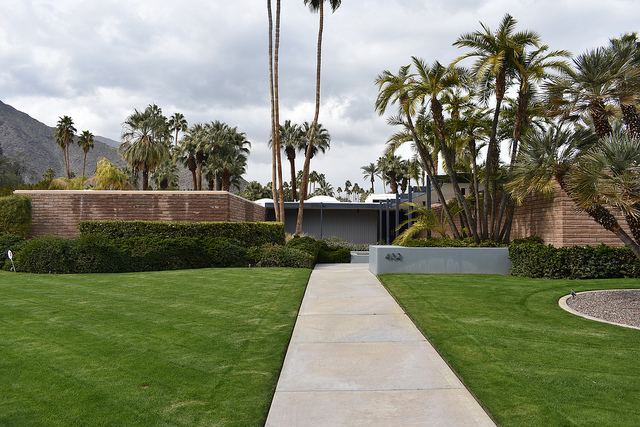 1959 - The Robert (Bob) Howard and Andrea Leeds House II, aka Leeds-Howard House II, 375 Via Lola, Palm Springs CA. 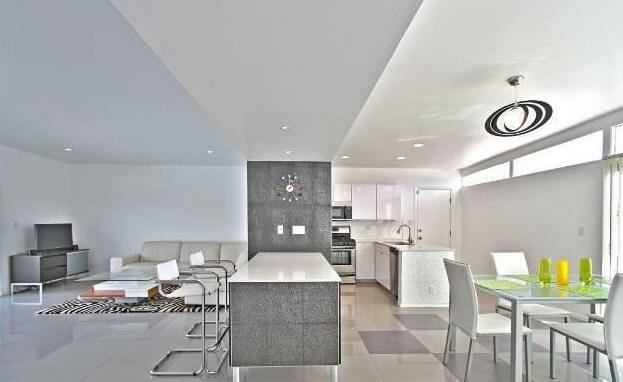 Sold to Sidney and Alexandra Sheldon who removed the Modernist features with a mishmash of renovations. 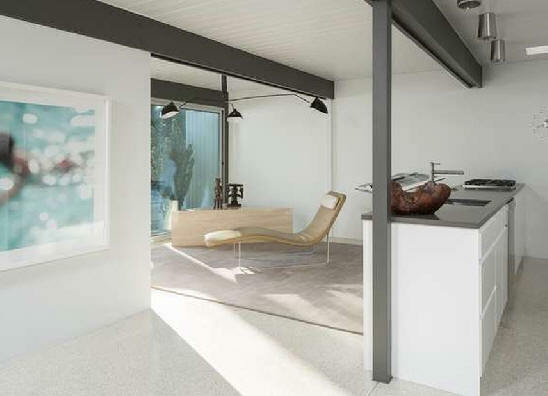 Sold to Kevin Lane and Matthew (Shev) Rush, who discovered its Wexler roots and did a complete Modernist restoration. Sold in 2016 to Diane Bald. 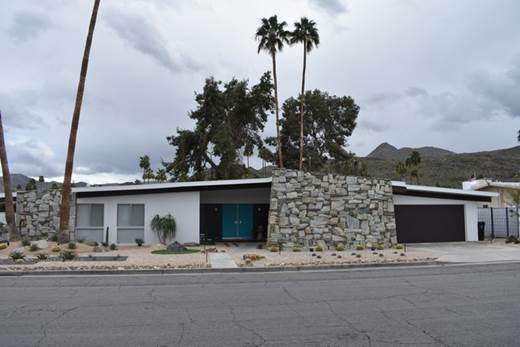 1959 - aka The Zen House, 1344 South Calle de Maria, Palm Springs CA. Sometimes listed as 1366 or 1368. Sold to Avi Levi. Sold in 2014 to the Kirkwood family. For sale in 2018. 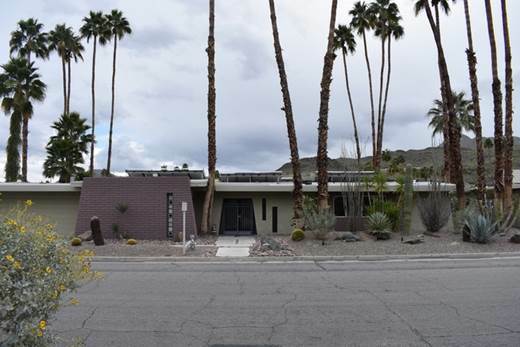 1959 - The Royal Hawaiian Estates Condominiums, encompassing East Twin Palms Drive, South Palm Canyon Drive, and Canyon Rock Road, Palm Springs CA. 40 units, 12 buildings. Development was created for Jewish seniors. 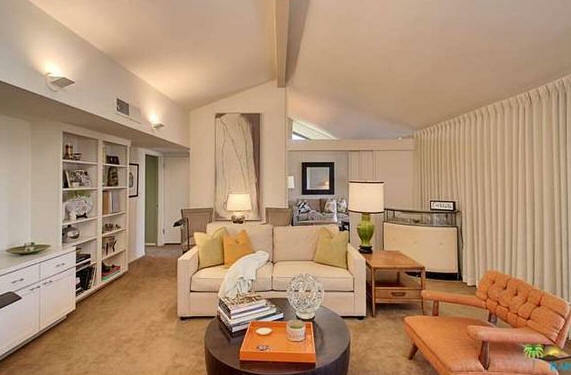 Above representative unit: The Philip Short Condo, 1774 South Palm Canyon Drive, Palm Springs CA. Short was the developer. Sold to Richard A. Morris in 2005. Sold in 2015 to Eric Johnston. 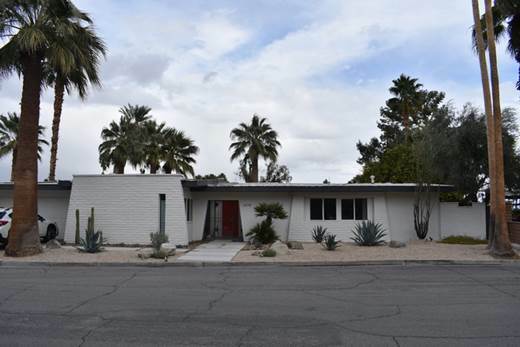 1959 – 3510 East Camino Rojos, Palm Springs CA. Designed with Richard Harrison. Developed by Roy Fey as part of the El Rancho Vista subdivision. Sold in 2017 to Michale and Sarah Ladwig. Photo by Michael Locke. 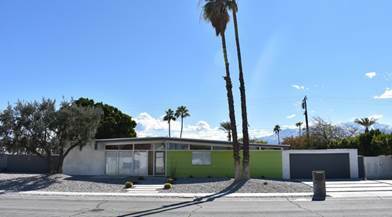 1959 – 3570 East Camino Rojos, Palm Springs CA. Designed with Richard Harrison. Developed by Roy Fey as part of the El Rancho Vista subdivision. Sold to Perlita Ramirez. Photo by Michael Locke. 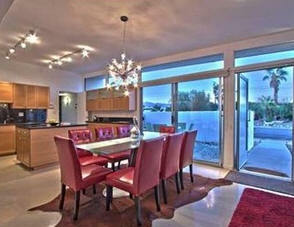 3690 East Avenida Fey Norte, Palm Springs CA. Sold in 2013 to Libby Christopher. 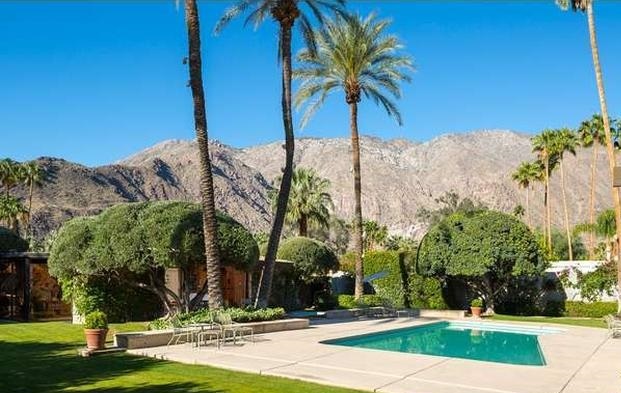 1633 Via Roberto Miguel, Palm Springs CA. Sold in 2014 to Moore Marchant Investments. 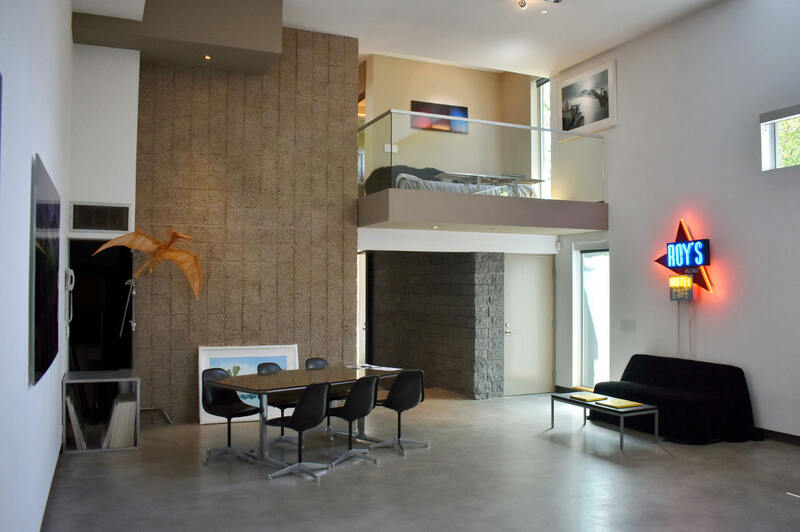 3467 East Paseo Barbara, Palm Springs CA. Sold in 2015 to Jimmie Overton. 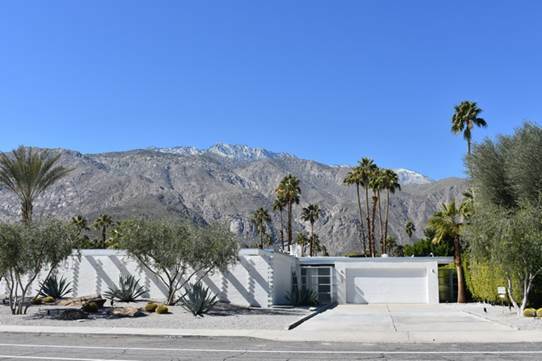 1960 - The El Rancho Vista Estates, encompassing East Avenida Fey Norte, Via Roberto Miguel, East Paseo Barbara, and El Camino Rojas, Palm Springs CA. Designed with Harrison. Developed for Roy Fey. 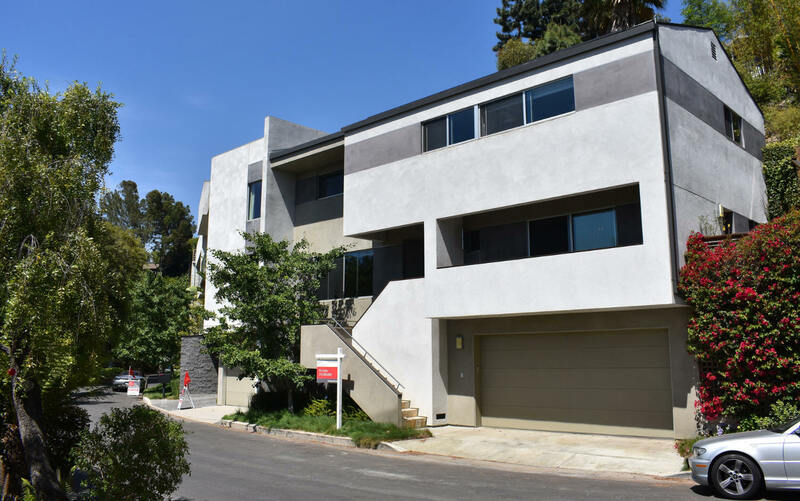 About 70 homes and three basic floor plans, although the tract has more of a custom home feel due to alternating elevations, rooflines, and use of decorative concrete block. The houses above are representative of the development. 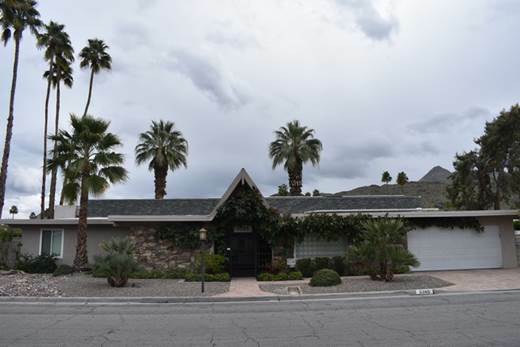 1960 – 3573 East Camino Rojos, Palm Springs CA. Designed with Richard Harrison. Developed by Roy Fey as part of the El Rancho Vista subdivision. Sold in 2010 to Norman Tanber. Photo by Michael Locke. 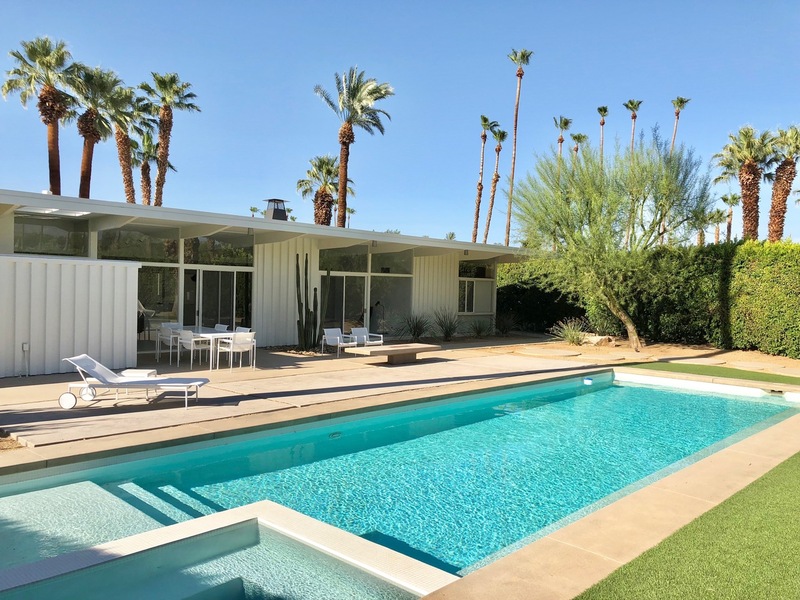 1960 – 3552 East Camino Rojos, Palm Springs CA. Designed with Rick Harrison. Developed by Roy Fey as part of the El Rancho Vista subdivision. Sold in 2010 to Gregory Bunton. Photo by Michael Locke. 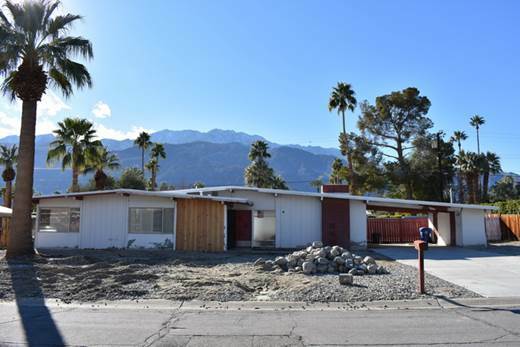 1960 – 3556 East Camino Rojos, Palm Springs CA. Designed with Rick Harrison. Developed by Roy Fey as part of the El Rancho Vista subdivision. Photo by Michael Locke. 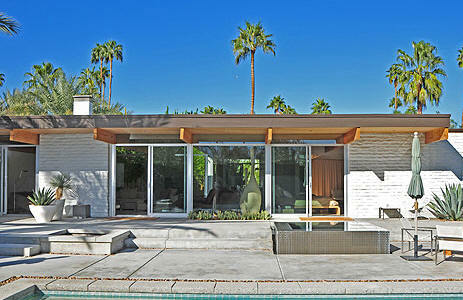 1960 - The Roy Fey Spec House, 615 Avenida Caballeros, Palm Springs CA. Sold to Michael Huard and Steven Winckler. 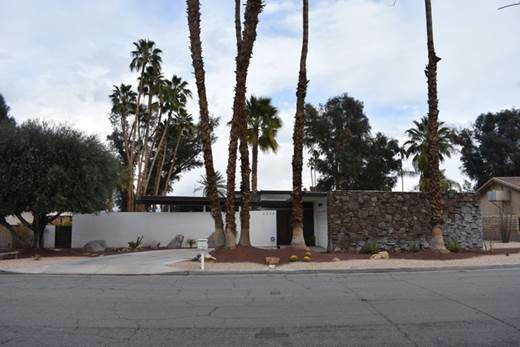 1960 - The Roy Fey Spec House, 755 Avenida Caballeros, Palm Springs CA. Sold in 2014. 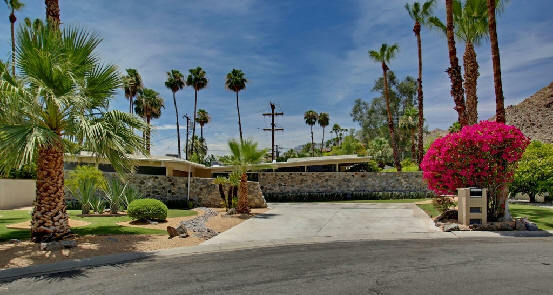 1960 - The Roy Fey Spec House, 681 Avenida Caballeros, Palm Springs CA. Sold to Lisa Carlomagno. 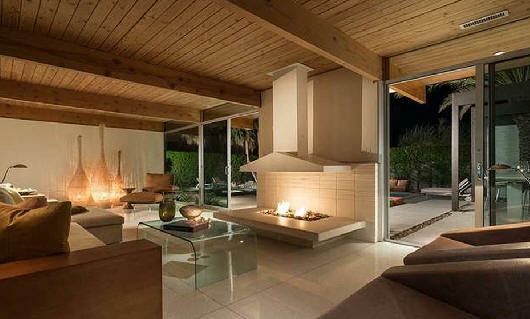 1960 - The Roy Fey Spec House, 620 North Camino Real, Palm Springs CA. 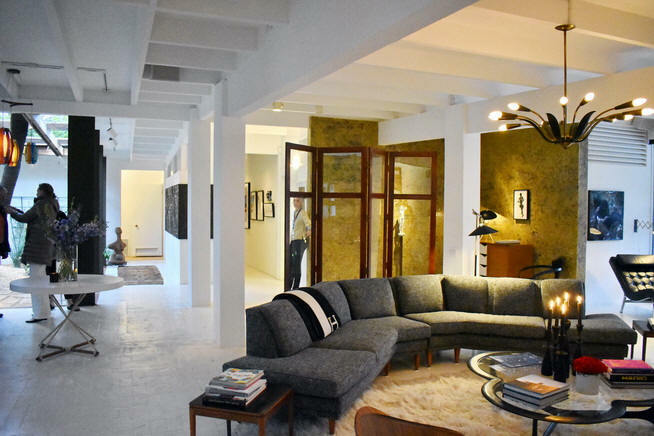 Sold in 2012 to Michael Gendler and Nan Johnson. 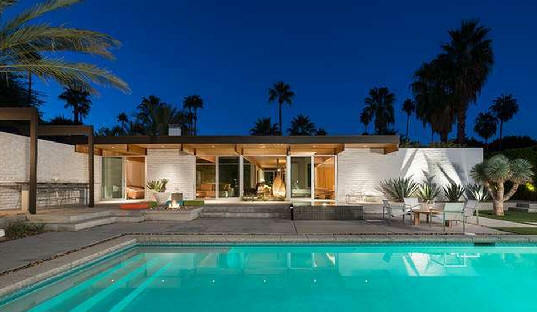 1960 - The Roy Fey Spec House, aka the Tony Curtis and Janet Leigh House, 641 North Camino Real, Palm Springs CA. 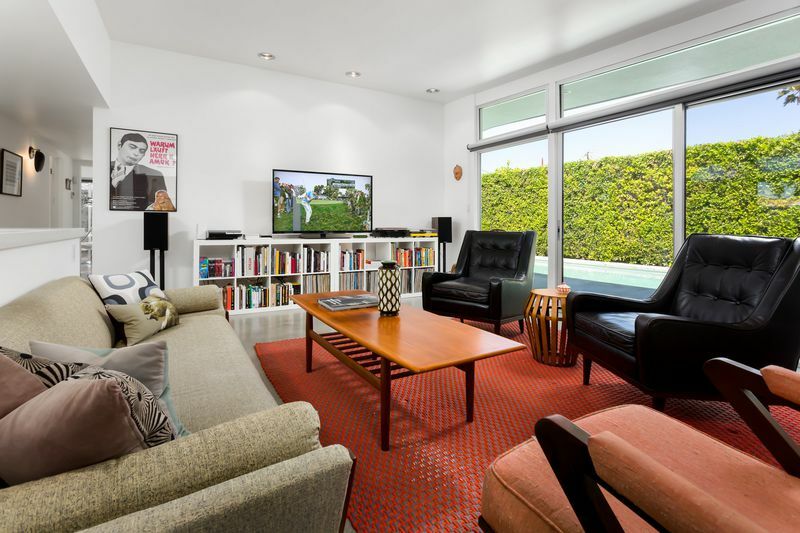 Sold in 2010 to Mark Harris and Kate Williamson. 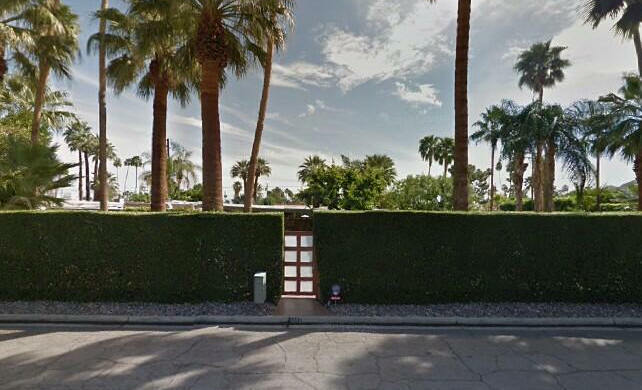 1960 - 71048 Country Club Drive, aka None Such Road, Rancho Mirage CA. Sold to H. D. Wright. Sold in 2015 to Michael Alexonis and Hope Garrison. Part of Thunderbird North, ten homes on Country Club Drive, Morningsprings Road, Morningside Drive, and Early Times Road designed in 1957 around a communal swimming pool designed by Wexler and William Cody. 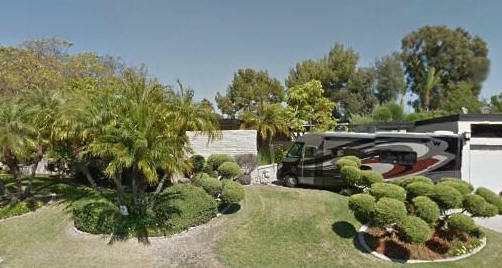 1960 - 71049 Early Times Road, Rancho Mirage CA. 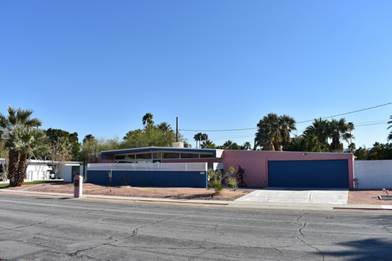 Part of Thunderbird North, ten homes on Country Club Drive, Morningsprings Road, Morningside Drive, and Early Times Road designed in 1957 around a communal swimming pool designed by Wexler and William Cody.Sold to Lawrence B. Chrysler. Altered, badly, in the 1990's. Sold in 2015. 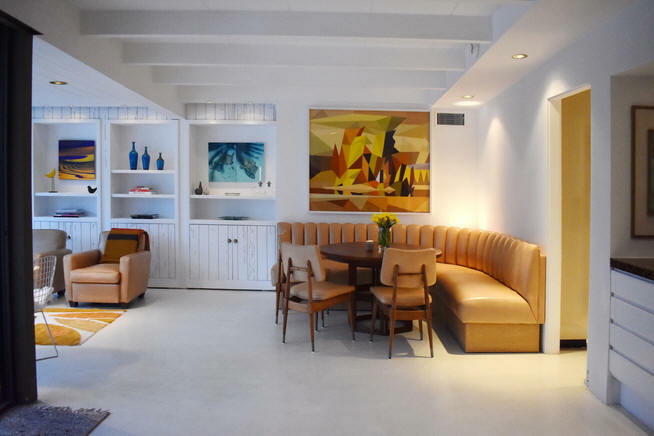 Restored and renovated by Brad Dunning who provided the interior photos. 1960 - The Bernard and Adele Perlin, 1044 Montego Drive, Los Angeles CA. Still owned by the Perlin Trust as of 2014. 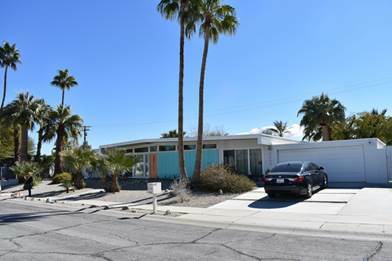 Around 1960 - The Steel House, 1230 Mason Street, Las Vegas NV. Photo by Brad Dunning. 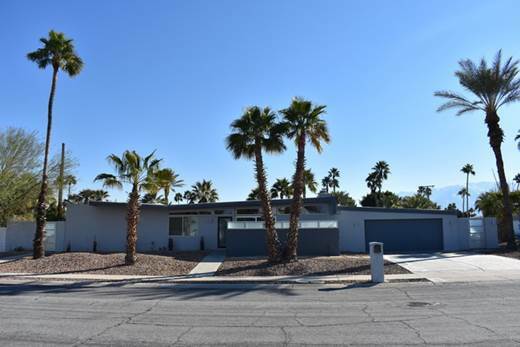 1960 – 3472 East Camino Rojos, Palm Springs CA. Designed with Rick Harrison. Developed by Roy Fey as part of the El Rancho Vista subdivision. Sold in 2012 to Thomas Danon. Photo by Michael Locke. 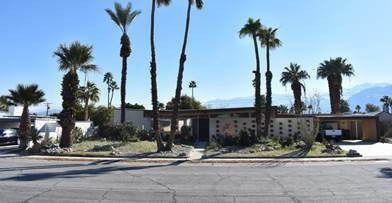 1960 – 3477 East Camino Rojos, Palm Springs CA. Designed with Rick Harrison. Developed by Roy Fey as part of the El Rancho Vista subdivision. Sold in 2008 to David Weldert. Photo by Michael Locke. 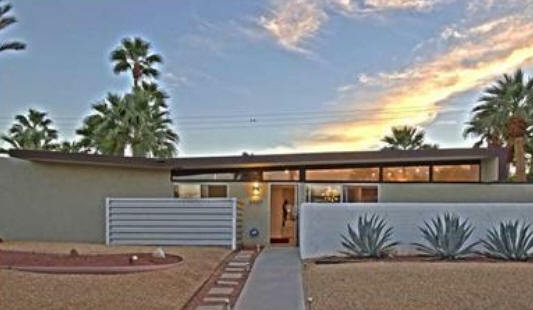 1960 – 3488 East Paseo Barbara, Palm Springs CA. Designed with Rick Harrison. Developed by Roy Fey as part of the El Rancho Vista subdivision. Sold to George and Goldie Jacoby. Photo by Michael Locke. 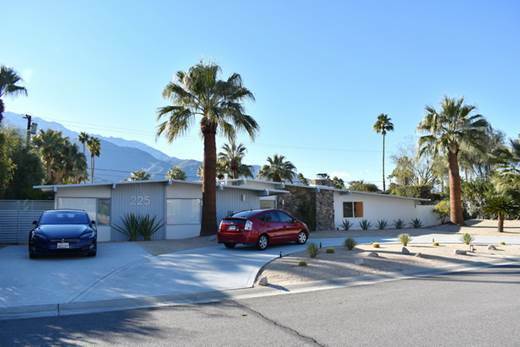 1960 – 3555 East Camino Rojos, Palm Springs CA. Designed with Rick Harrison. Developed by Roy Fey as part of the El Rancho Vista subdivision. Sold in 1989 to Janice Kleinschmidt. Photo by Michael Locke. 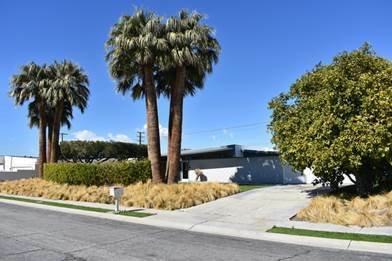 1960 – 3597 East Paseo Barbara, Palm Springs CA. Designed with Rick Harrison. Developed by Roy Fey as part of the El Rancho Vista subdivision. Sold to Hana, Brian, and Patricia Wexler. (Brian is Donald Wexler's son.) Photo by Michael Locke. 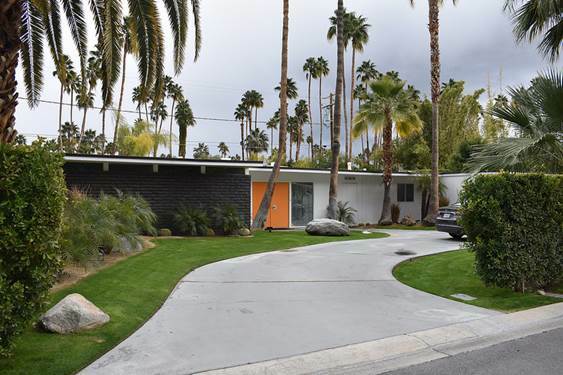 1960 – 3622 East Paseo Barbara, Palm Springs CA. Designed with Rick Harrison. Developed by Roy Fey as part of the El Rancho Vista subdivision. Sold in 2015 to Paula Oelhberg. Photo by Michael Locke. 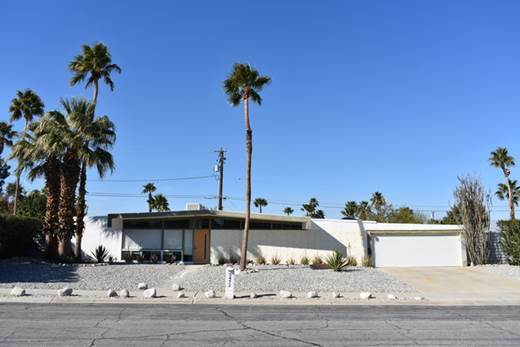 1960 – 3625 East Paseo Barbara, Palm Springs CA. Designed with Rick Harrison. Developed by Roy Fey as part of the El Rancho Vista subdivision. Sold in 2015 to Joel Alverson and Michael Parkey. Photo by Michael Locke. 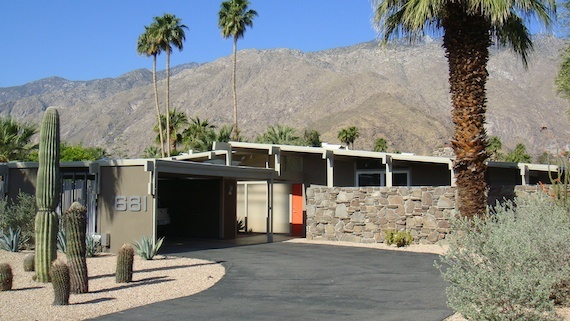 1960 – 3663 East Paseo Barbara, Palm Springs CA. Designed with Rick Harrison. Developed by Roy Fey as part of the El Rancho Vista subdivision. Sold in 2001 to Nancy Nolan. Photo by Michael Locke. 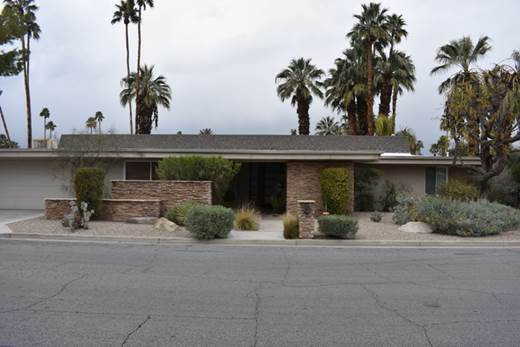 1960 – 3598 East Paseo Barbara, Palm Springs CA. Designed with Rick Harrison. Developed by Roy Fey as part of the El Rancho Vista subdivision. Sold in 2013 to the Waterman family. Photo by Michael Locke. 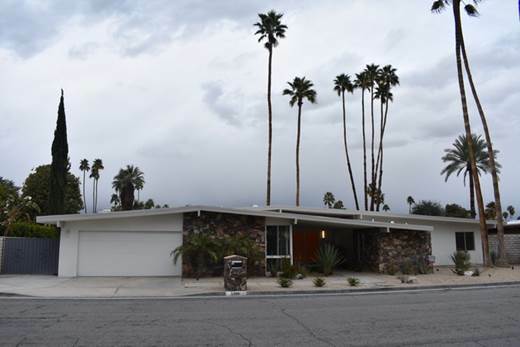 1960 – 3666 East Paseo Barbara, Palm Springs CA. Designed with Rick Harrison. Developed by Roy Fey as part of the El Rancho Vista subdivision. Photo by Michael Locke. 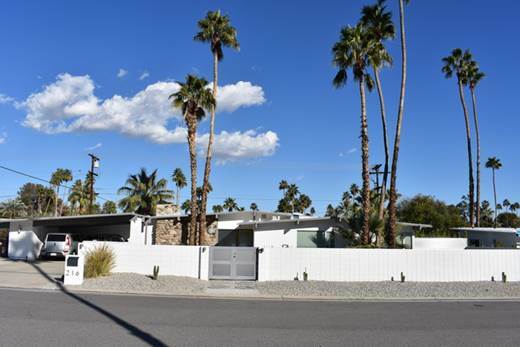 1960 – 3676 East Paseo Barbara, Palm Springs CA. Designed with Rick Harrison. Developed by Roy Fey as part of the El Rancho Vista subdivision. Photo by Michael Locke. 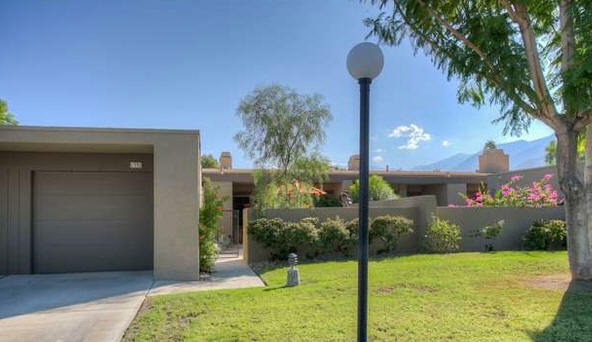 1960 – 3694 East Camino Rojos, Palm Springs CA. Designed with Rick Harrison. Developed by Roy Fey as part of the El Rancho Vista subdivision. Photo by Michael Locke. 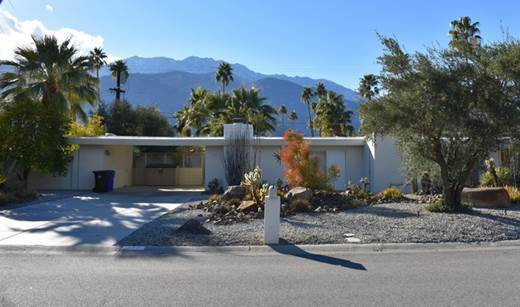 1960 – 3695 East Camino Rojos, Palm Springs CA. Designed with Rick Harrison. Developed by Roy Fey as part of the El Rancho Vista subdivision. Photo by Michael Locke. 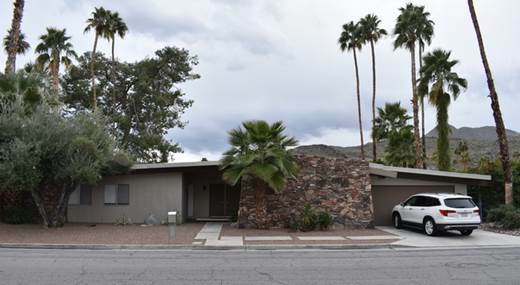 1960 – 1521 Via Roberto Miguel, Palm Springs CA. Designed with Rick Harrison. Developed by Roy Fey as part of the El Rancho Vista subdivision. For sale in 2019. Photos by Michael Locke. 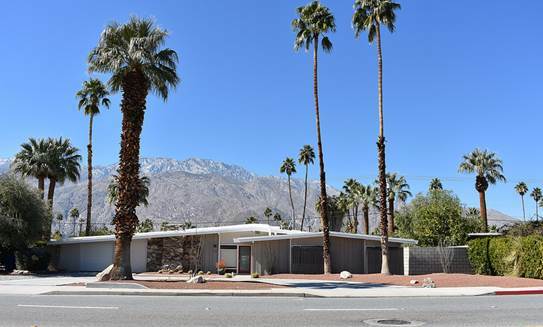 1960 – 3676 East Paseo Barbara, Palm Springs CA. Designed with Rick Harrison. Developed by Roy Fey as part of the El Rancho Vista subdivision. For sale in 2019. Photos by Michael Locke. 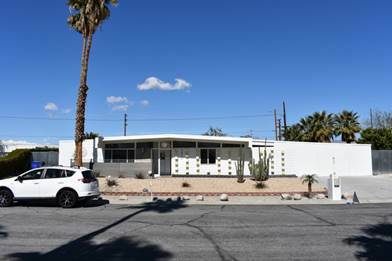 1961 – 615 North Avenida Caballeros, Palm Springs CA. Designed with Richard Harrison. Photo by Michael Locke. 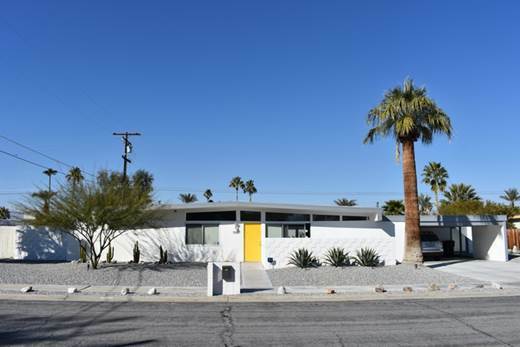 1961 – 681 North Avenida Caballeros, Palm Springs CA. Designed with Richard Harrison. Photo by Michael Locke. 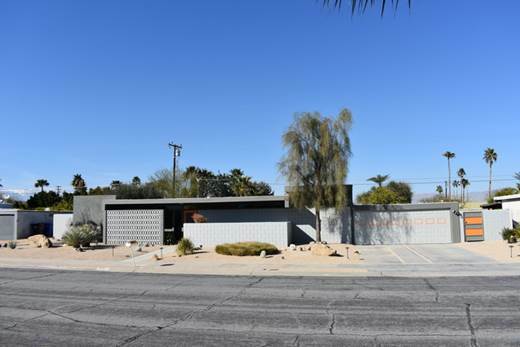 1961 – 755 North Avenida Caballeros, Palm Springs CA. Designed with Richard Harrison. Photo by Michael Locke. 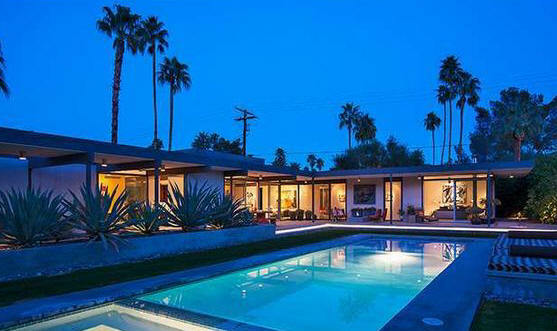 1961 – Tony Curtis and Janet Leigh House, 641 North Camino Real, Palm Springs CA. Designed with Richard Harrison. 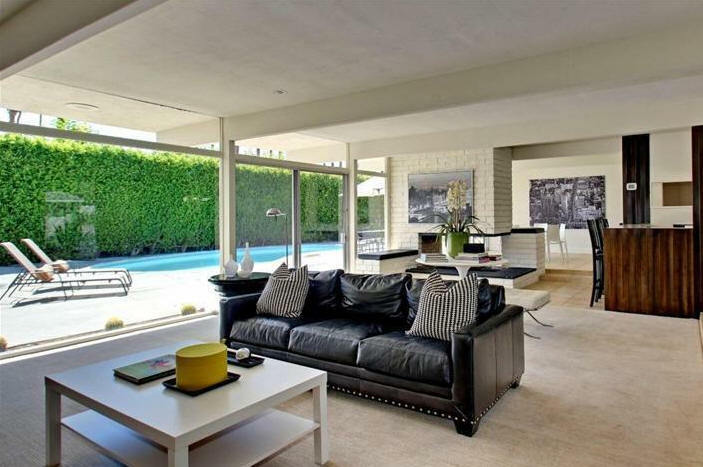 The architects designed the house for actors Tony Curtis and Janet Leigh in 1961 for $46,000. The house was known as "Camp Curtis; the famous couple shared the home with their daughters Kelly and Jamie Lee until their divorce in 1962. Leigh sold the house two years later. Photo by Michael Locke. 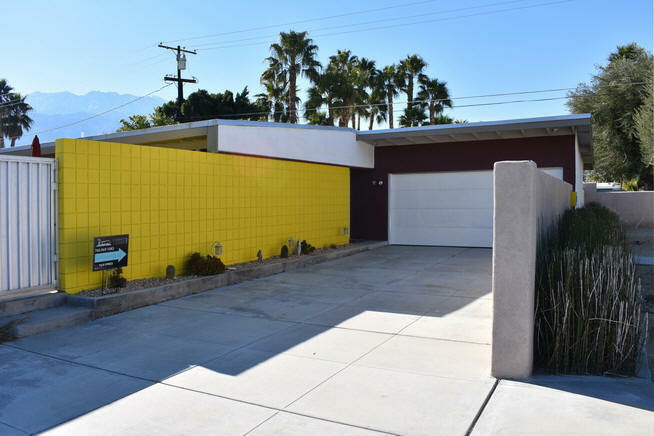 1961 – 3666 East Camino Rojos, Palm Springs CA. Designed with Rick Harrison. Developed by Roy Fey as part of the El Rancho Vista subdivision. Sold in 2010 to Georgia Anderson and Tiffany Poremba. Photo by Michael Locke. 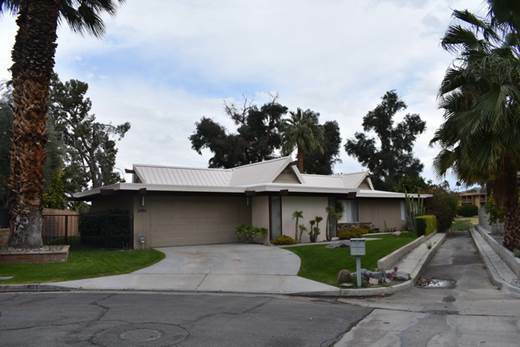 1961 – 3663 East Camino Rojos, Palm Springs CA. Designed with Rick Harrison. Developed by Roy Fey as part of the El Rancho Vista subdivision. Sold in 1989 to William Newman. Photo by Michael Locke. 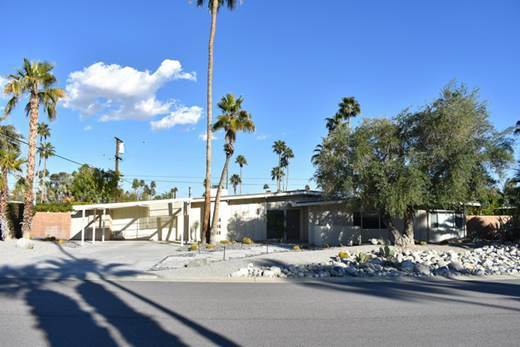 1961 – 3600 East Camino Rojos, Palm Springs CA. Designed with Rick Harrison. Developed by Roy Fey as part of the El Rancho Vista subdivision. Sold in 2001 to James Coogan. Photo by Michael Locke. 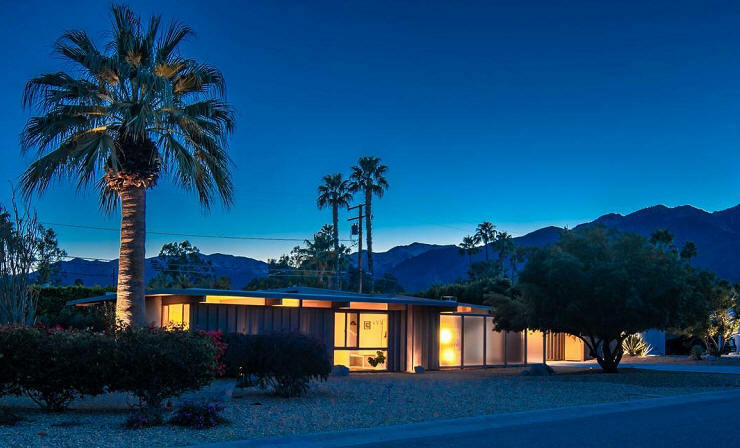 1961 - 1555 Via Roberto Miguel, Palm Springs CA. Sold in 2018. 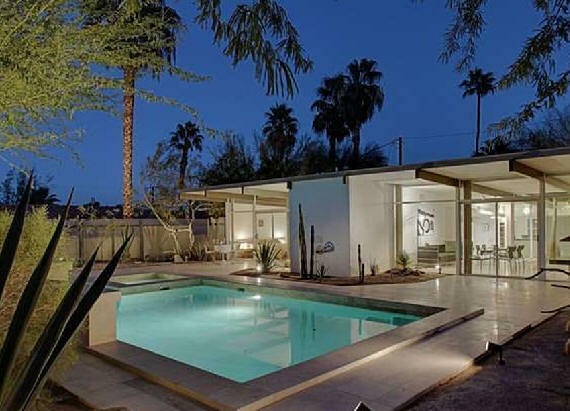 1961 – 3555 East Paseo Barbara, Palm Springs CA. Designed with Rick Harrison. Developed by Roy Fey as part of the El Rancho Vista subdivision. Sold in 2015 to James Citron. Photo by Michael Locke. 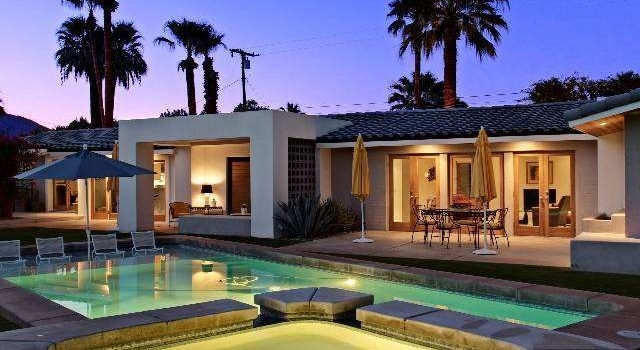 1961 – 3395 East Camino Rojos, Palm Springs CA. Designed with Rick Harrison. Developed by Roy Fey as part of the El Rancho Vista subdivision. Sold in 2015 to Kenneth and Sarah Greenberg. Photo by Michael Locke. 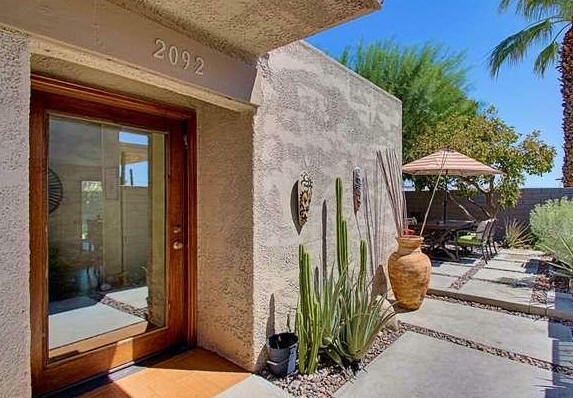 1961 – 3420 East Camino Rojos, Palm Springs CA. Designed with Rick Harrison. Developed by Roy Fey as part of the El Rancho Vista subdivision. Sold in 2012 to Brian and Danielle Parisi. Photo by Michael Locke. 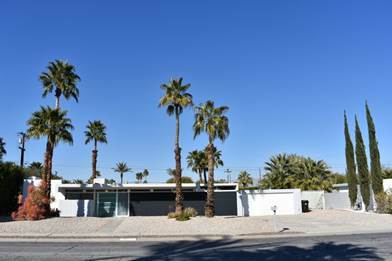 1962 - The Calcor/Rheem Prefabricated Steel House, aka Wexler Steel House 1 of 7, 290 East Simms Road, Palm Springs CA. Commissioned 1961. Developed by the Alexander Construction Company. Bernard Perlin was the engineer. 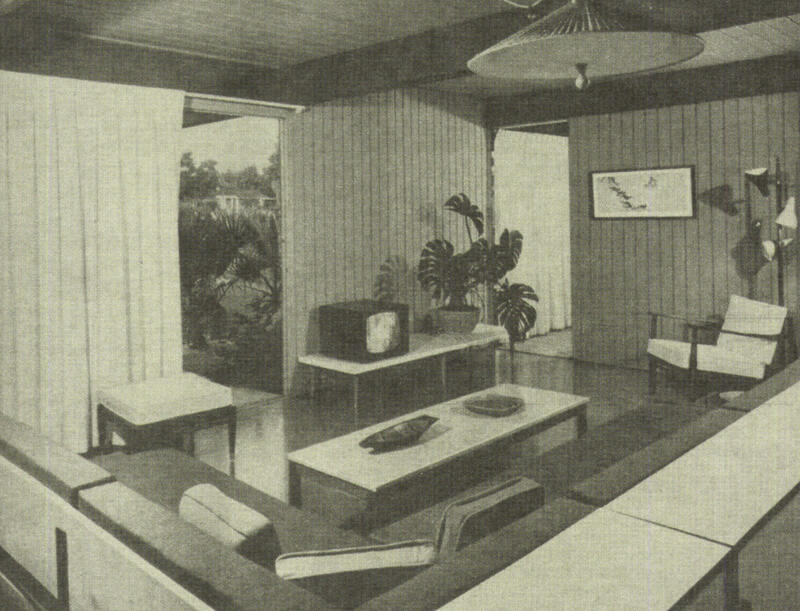 Interiors by Arthur Elrod. Featured in Architectural Record May 1963. Sold in 2013 to John C. Manly. 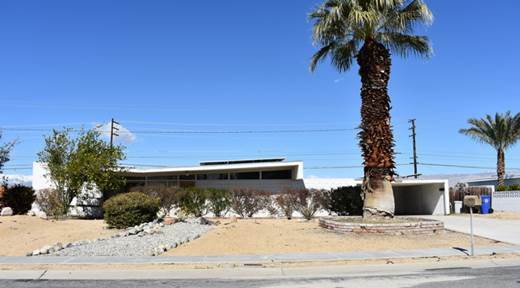 1962 - The Calcor/Rheem Prefabricated Steel House, aka Wexler Steel House 2 of 7, 3125 Sunny View Drive, Palm Springs CA. Commissioned 1961. Developed by the Alexander Construction Company. Bernard Perlin was the engineer. Interiors by Arthur Elrod. Featured in Architectural Record May 1963. Sold in 2006 to Brian William McGuire. For sale in 2018. 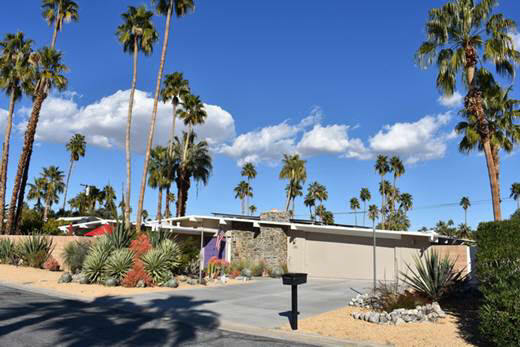 1962 - The Calcor/Rheem Prefabricated Steel House, aka Wexler Steel House 3 of 7, 3100 Sunny View Drive, Palm Springs CA. Commissioned 1961. Developed by the Alexander Construction Company. Bernard Perlin was the engineer. Interiors by Arthur Elrod. Featured in Architectural Record May 1963. Sold in 1993 to James William Moore. 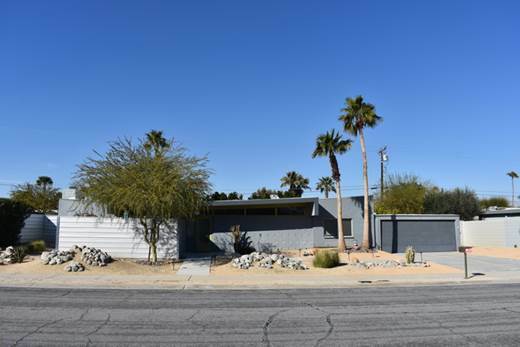 1962 - The Calcor/Rheem Prefabricated Steel House, aka Wexler Steel House 4 of 7, 3133 Sunny View Drive, Palm Springs CA. Commissioned 1961. Developed by the Alexander Construction Company. Bernard Perlin was the engineer. Sold in 2014 to David P. Salinger and James W. Longtin. 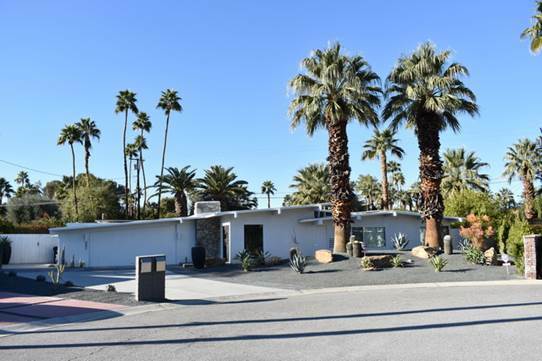 1962 - The Calcor/Rheem Prefabricated Steel House, aka Wexler Steel House 5 of 7, 3165 Sunny View Drive, Palm Springs CA. Commissioned 1961. Developed by the Alexander Construction Company. Bernard Perlin was the engineer. Sold to Douglas Keeve and Mary Ann Webster. 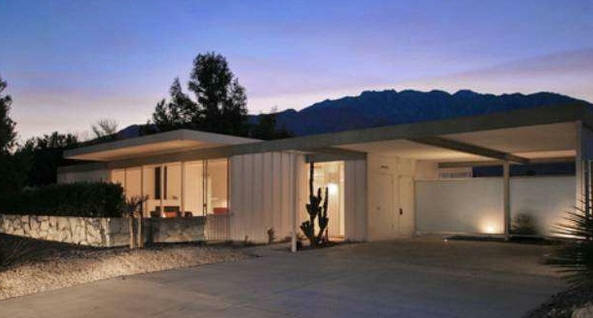 1962 - The Calcor/Rheem Prefabricated Steel House, aka Wexler Steel House 6 of 7, 300 Molino Road, Palm Springs CA. Commissioned 1961. Developed by the Alexander Construction Company.Bernard Perlin was the engineer. Sold in 2007 to Thomas Carnase and Claire Victor. 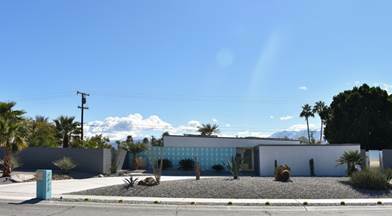 1962 - The Calcor/Rheem Prefabricated Steel House, aka Wexler Steel House 7 of 7, 330 Molino Road, Palm Springs CA. Commissioned 1961. Developed by the Alexander Construction Company. Bernard Perlin was the engineer. Sold in 1997 to James Isermann. 1962 - The Compton Apartment Development, Compton CA. Unbuilt. A project with I. J. Kahn and Associates. 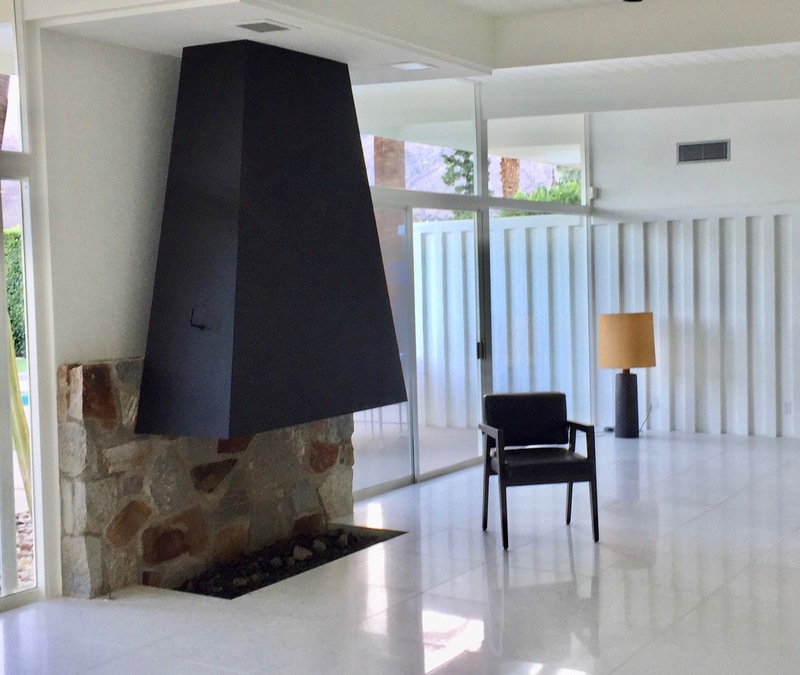 1964 - The Maurice and Dinah Shore Smith House, 432 West Hermosa Place, Palm Springs CA. 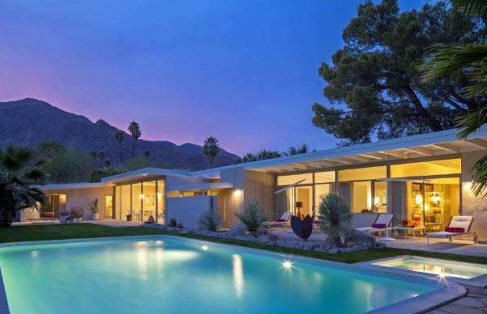 Built for actress/singer Dinah Shore and her husband. Sold in 2002 to David Lee. Restored by D. Crosby Ross in 2005. 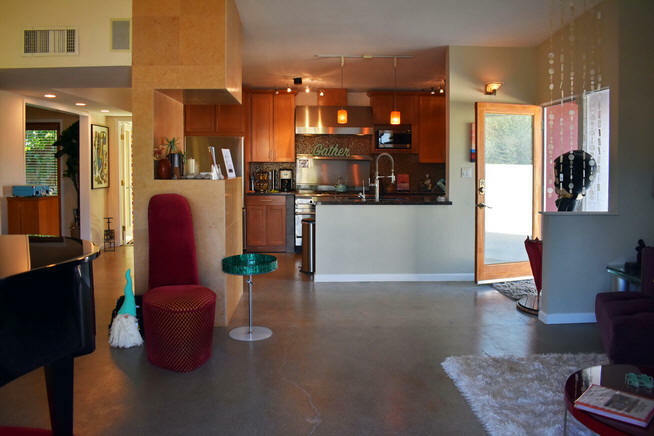 Sold in 2011 to Ben and Jude Lipps. 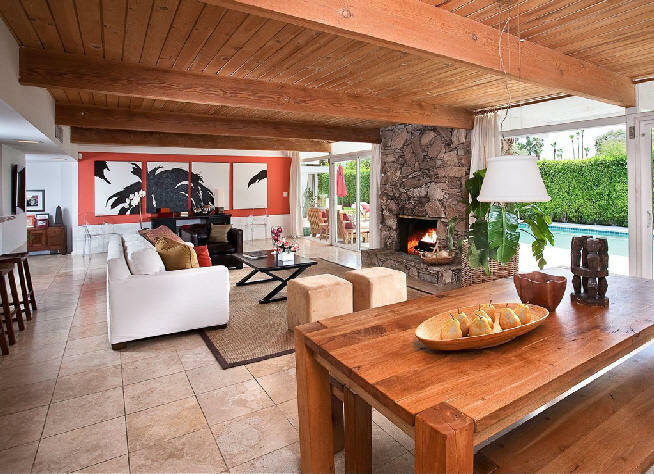 Sold in 2014 to Malibu Colony Pch Properties, a trust owned by actor Leonardo DiCaprio. Top photo by Michael Locke. Second photo by Glen Wexler. Available for rent. 1964 - The Leisure Life Village, 6127 Erlanger Street, San Diego CA. 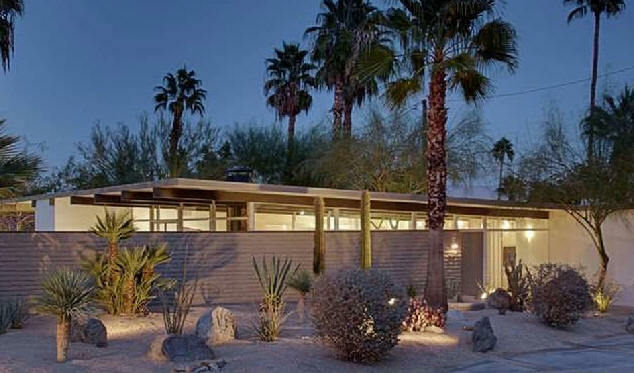 Originally started by architect William Krisel. 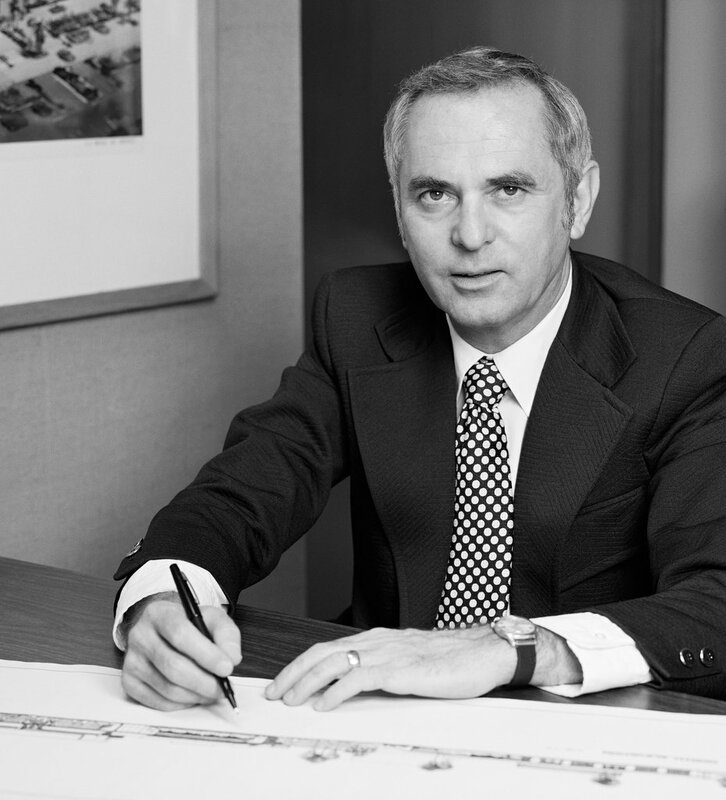 Builder and developer, Irvin J. Kahn. 248 single story steel apartment homes designed for active adults. Destroyed in 2009 for the 368-unit Cresta Bella Apartments. 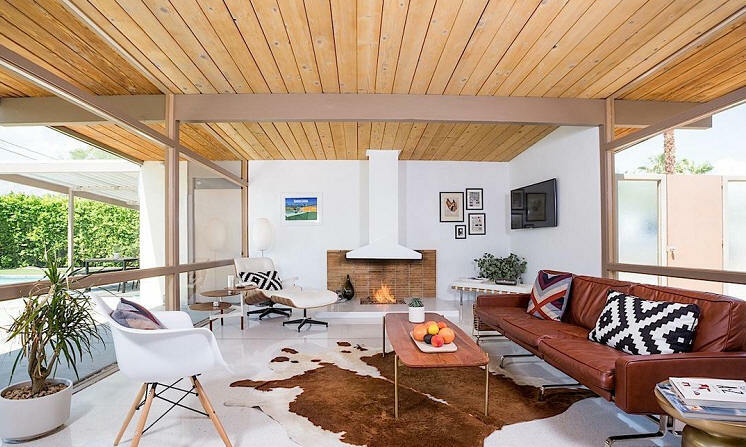 5355 East Lakeside Drive, Palm Springs CA. 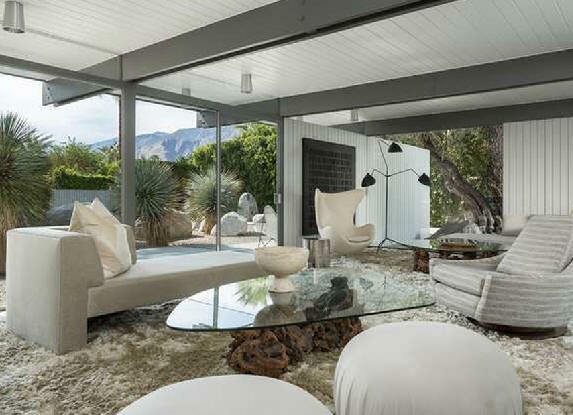 2455 South Pebble Beach, Palm Springs CA. 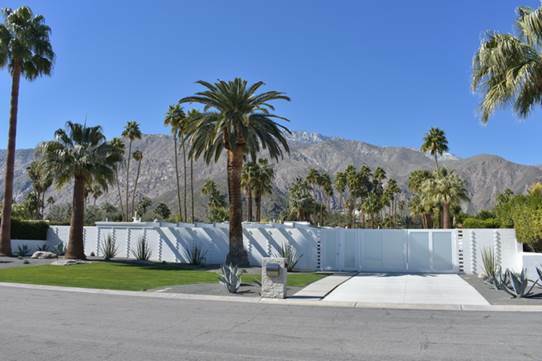 1964 - The Green Fairway Estates, built by the Alexander Construction Company, 5300 Block of East Lakeside Drive and the 2400 Block of South Pebble Beach Drive, Palm Springs CA. 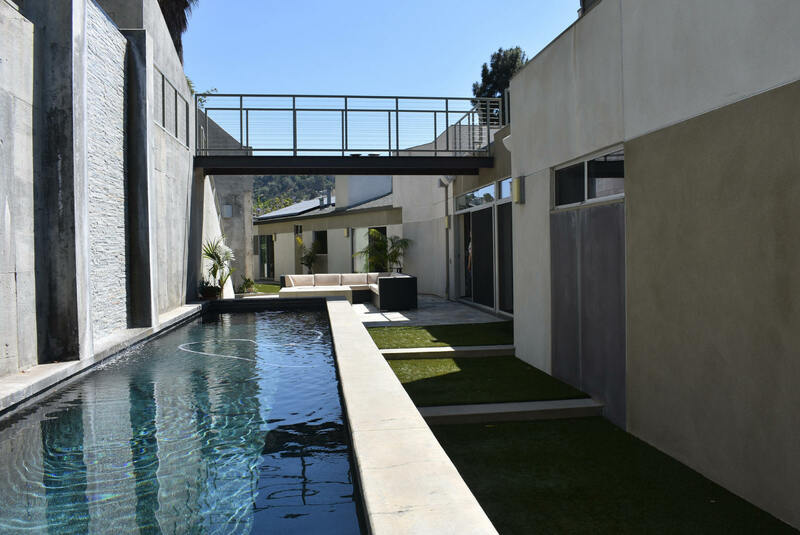 35 homes, all Wexler's design. Two representative houses, above. 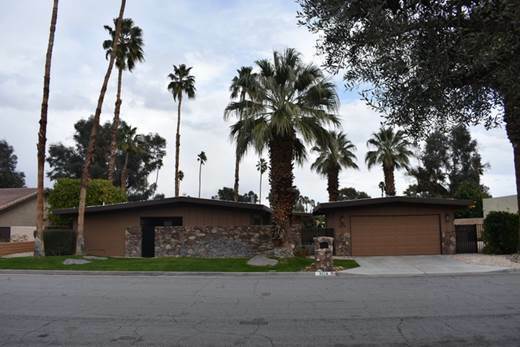 1965 – 2326 South Pebble Beach Drive, Palm Springs CA. Designed with Rick Harrison. Developed by the George Alexander Construction Company as part of the Green Fairway Estates subdivision. Sold in 2017 to Lorita and Jan Larsen. Photo by Michael Locke. 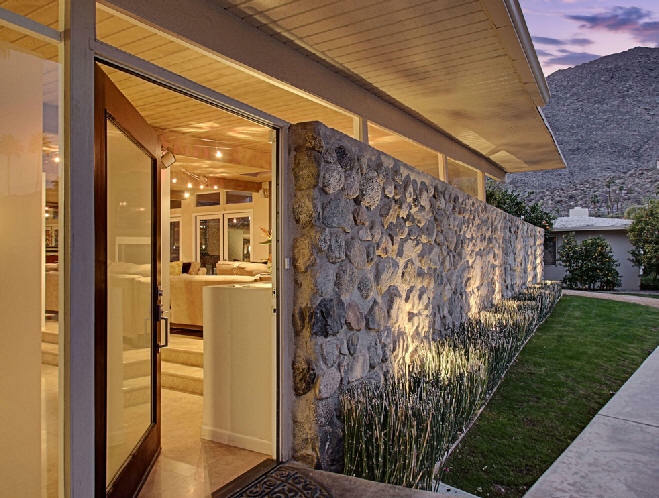 1965 – 2395 South Pebble Beach Drive, Palm Springs CA. Designed with Rick Harrison. Developed by the George Alexander Construction Company as part of the Green Fairway Estates subdivision. Sold in 2012 to Robin Rorex and Jennifer Gagner. Photo by Michael Locke. 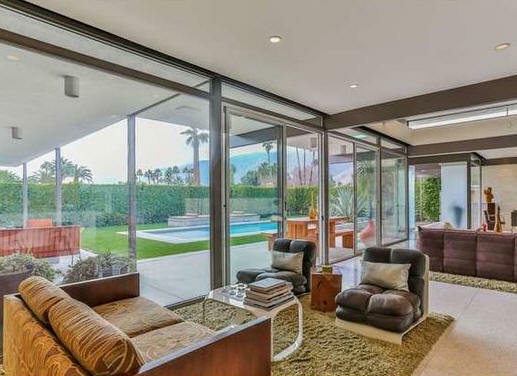 1965 – 2455 South Pebble Beach Drive, Palm Springs CA. Designed with Rick Harrison. Developed by the George Alexander Construction Company as part of the Green Fairway Estates subdivision. Sold in 2000 to Franklin and Janet Christensen. Photo by Michael Locke. 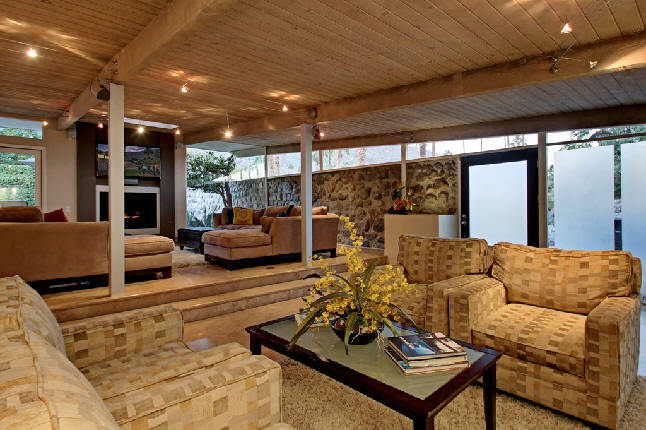 1965 – 2484 South Pebble Beach Drive, Palm Springs CA. Designed with Rick Harrison. Developed by the George Alexander Construction Company as part of the Green Fairway Estates subdivision. Sold in 2016 to Nicholas Baker and Frederik Clinckspoor. Photo by Michael Locke. 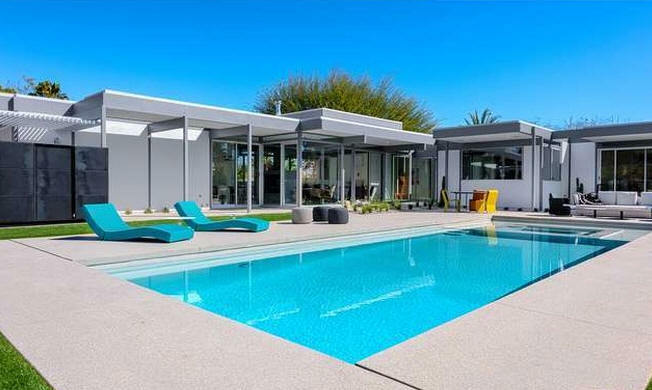 1965 – 5191 East Lakeside Drive, Palm Springs CA. Designed with Rick Harrison. Developed by the George Alexander Construction Company as part of the Green Fairway Estates subdivision. Sold to June Russel. Photo by Michael Locke. 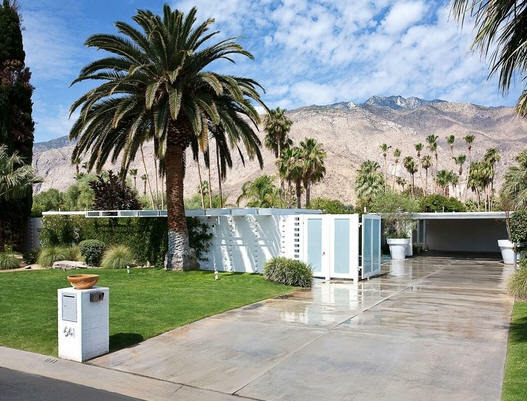 1965 – 5190 East Lakeside Drive, Palm Springs CA. Designed with Rick Harrison. Developed by the George Alexander Construction Company as part of the Green Fairway Estates subdivision. Sold in 2018 to the Donald and Genevieve Hauck Trust. Photo by Michael Locke. 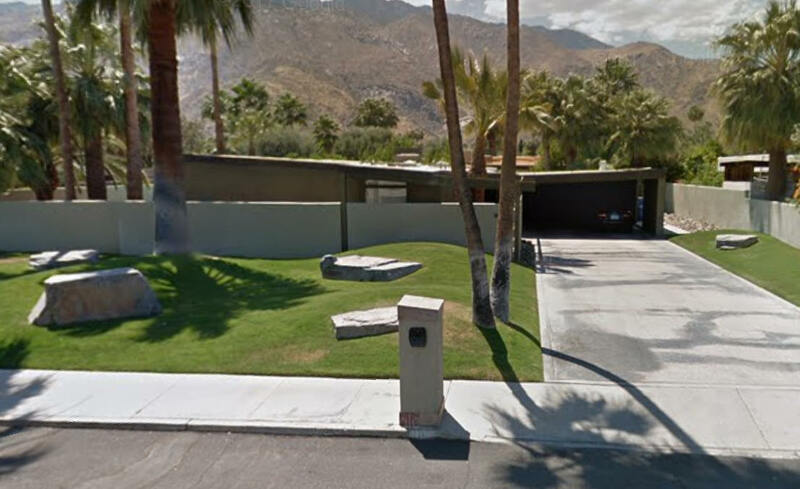 1965 – 5240 East Lakeside Drive, Palm Springs CA. Designed with Rick Harrison. Developed by the George Alexander Construction Company as part of the Green Fairway Estates subdivision. Photo by Michael Locke. 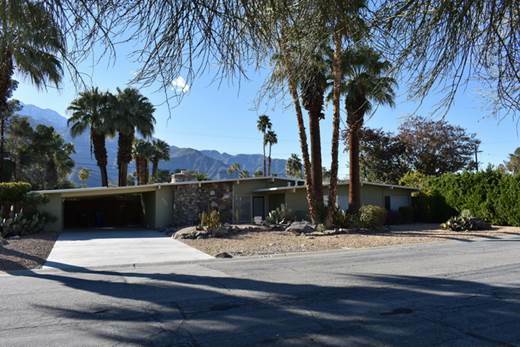 1965 – 5289 East Lakeside Drive, Palm Springs CA. Designed with Rick Harrison. Developed by the George Alexander Construction Company as part of the Green Fairway Estates subdivision. Photo by Michael Locke. 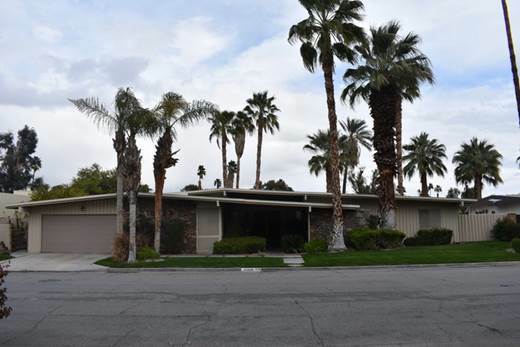 1965 – 5330 East Lakeside Drive, Palm Springs CA. Designed with Rick Harrison. Developed by the George Alexander Construction Company as part of the Green Fairway Estates subdivision. Photo by Michael Locke. 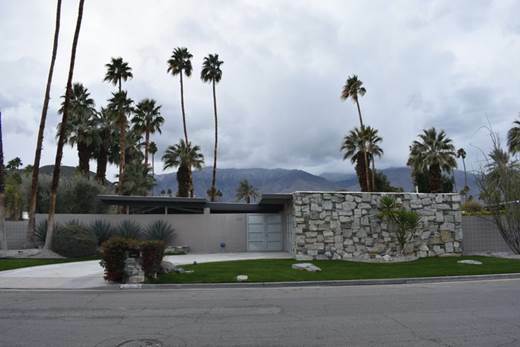 1966 – 5305 East Lakeside Drive, Palm Springs CA. Designed with Rick Harrison. Developed by the George Alexander Construction Company as part of the Green Fairway Estates subdivision. Photo by Michael Locke. 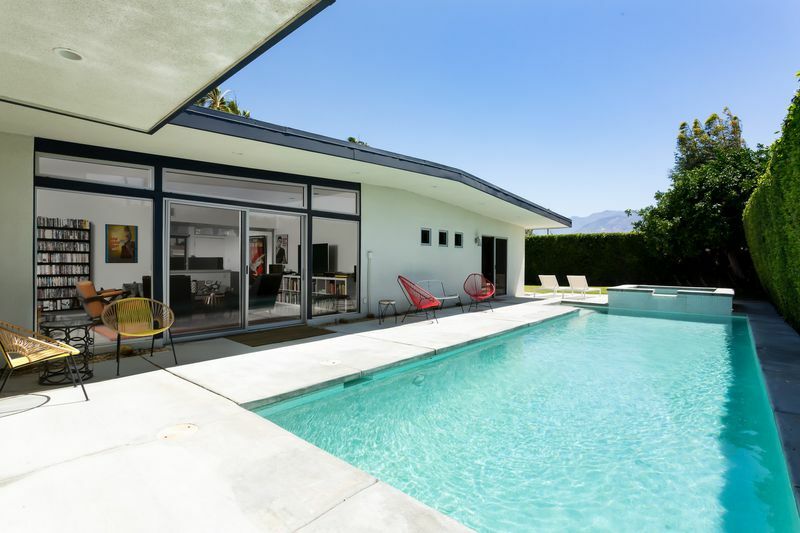 1966 – 5282 East Lakeside Drive, Palm Springs CA. Designed with Rick Harrison. Developed by the George Alexander Construction Company as part of the Green Fairway Estates subdivision. Photo by Michael Locke. 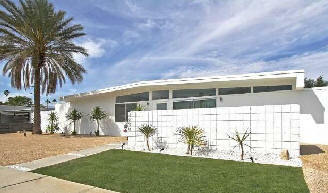 1966 – 2466 South Pebble Beach Drive, Palm Springs CA. Designed with Rick Harrison. Developed by the George Alexander Construction Company as part of the Green Fairway Estates subdivision. Sold in 1999 to William and Sharon Strebin. Photo by Michael Locke. 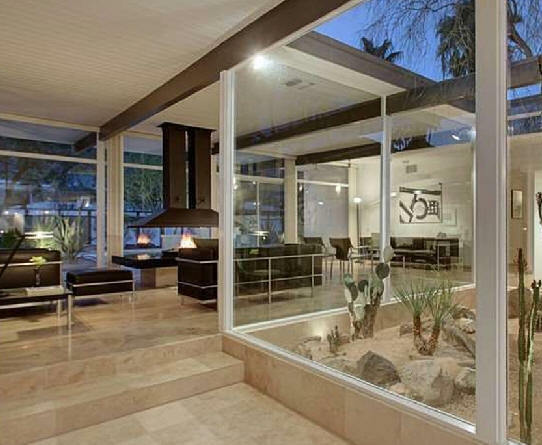 1966 – 2478 South Pebble Beach Drive, Palm Springs CA. Designed with Rick Harrison. Developed by the George Alexander Construction Company as part of the Green Fairway Estates subdivision. Sold in 2017 to Joseph Gamble and Terry Anderson. Photo by Michael Locke. Sold in 2016 to William O'Donnell and Michael Sauro. 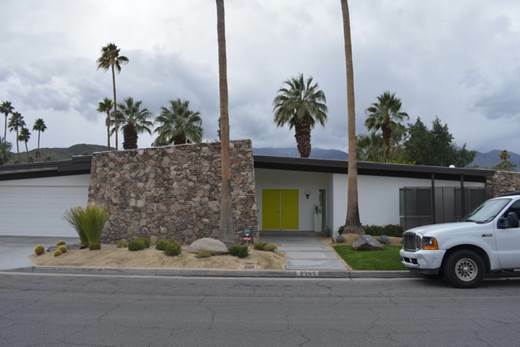 1966 – 2424 South Pebble Beach Drive, Palm Springs CA. Designed with Rick Harrison. Developed by the George Alexander Construction Company as part of the Green Fairway Estates subdivision. Sold in 2016 to William O'Donnell and Michael Sauro. Photo by Michael Locke. 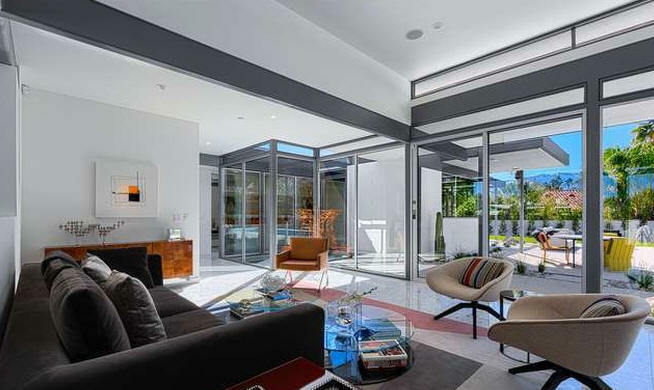 1966 – 2376 South Pebble Beach Drive, Palm Springs CA. Designed with Rick Harrison. Developed by the George Alexander Construction Company as part of the Green Fairway Estates subdivision. Sold in 2011 to Paul Valastin and Loreen Paananen. Photo by Michael Locke. 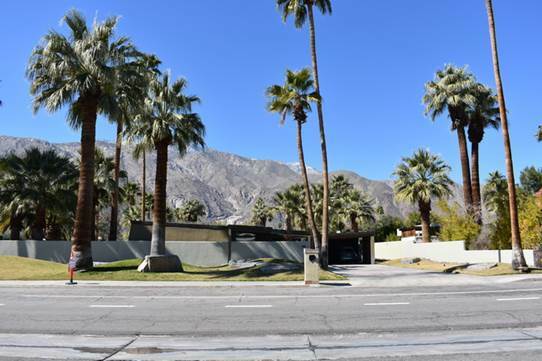 1967 – 5337 East Lakeside Drive, Palm Springs CA. Designed with Rick Harrison. Developed by the George Alexander Construction Company as part of the Green Fairway Estates subdivision. Photo by Michael Locke. 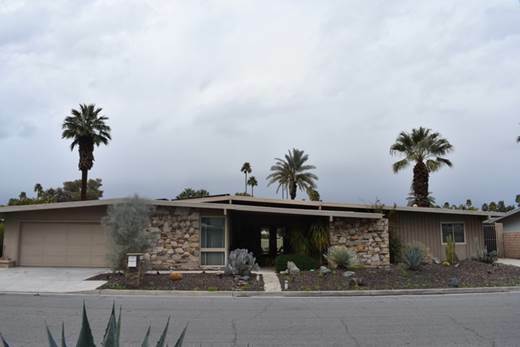 1967 – 5355 East Lakeside Drive, Palm Springs CA. Designed with Rick Harrison. Developed by the George Alexander Construction Company as part of the Green Fairway Estates subdivision. Photo by Michael Locke. 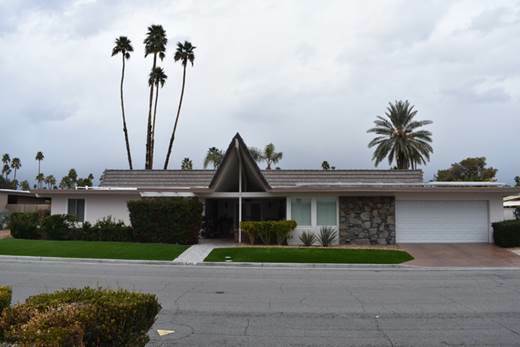 1967 – 5366 East Lakeside Drive, Palm Springs CA. Designed with Rick Harrison. Developed by the George Alexander Construction Company as part of the Green Fairway Estates subdivision. Photo by Michael Locke. 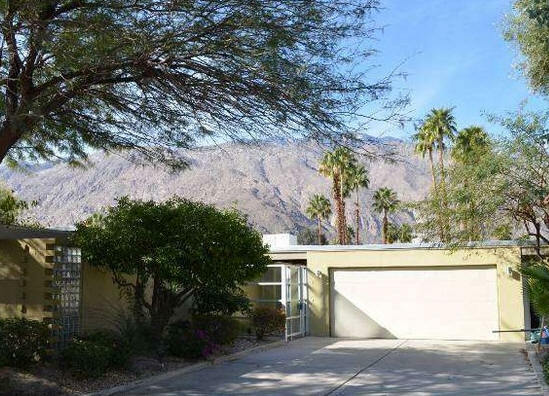 1967 – 5369 East Lakeside Drive, Palm Springs CA. Designed with Rick Harrison. Developed by the George Alexander Construction Company as part of the Green Fairway Estates subdivision. Photo by Michael Locke. 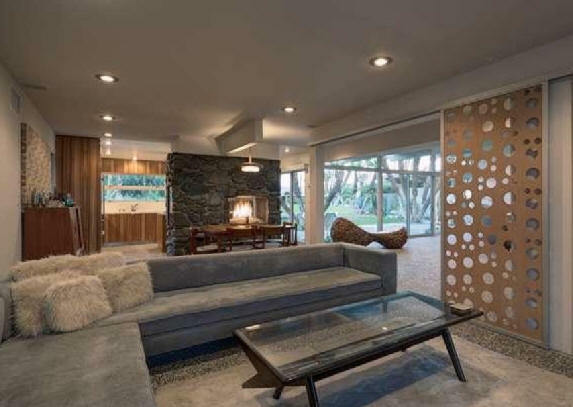 1967 - aka the AISI house, aka the Style in Steel House, 5280 Buck Hill Avenue, Buena Park CA. 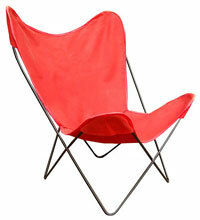 Designed for the Ray A. Watt Co., U. S. Steel, and American Iron and Steel Institute (AISI). Sold to George Daly. 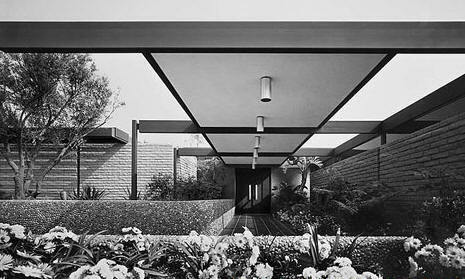 BW photos by Julius Shulman. Sold in 2006 to Young J. Paik. 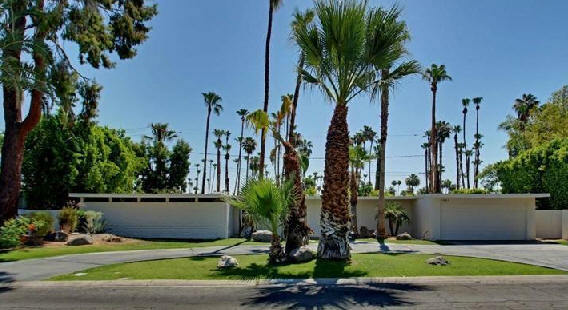 1968 - The Garden Apartments, Indio CA. Unbuilt. Project for Hight Construction Company. 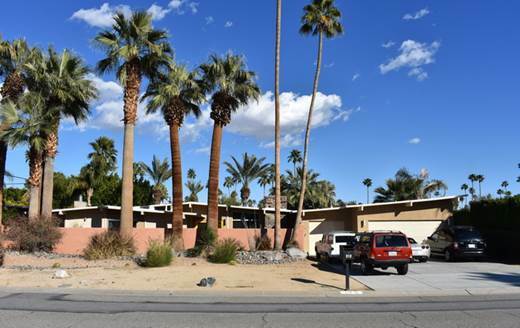 1969 - Two Bunch Palms Condominiums, Desert Hot Springs CA. Unbuilt. Project for Hammel, Green, and Abrahamson. 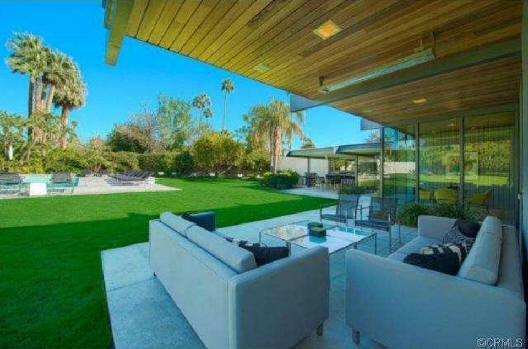 1969 - The Michael and Barbara Heathman House, 633 South La Mirada Drive, Palm Springs CA. Renovated by Wexler in 1987. Sold to Robert Kaplan in 1996. 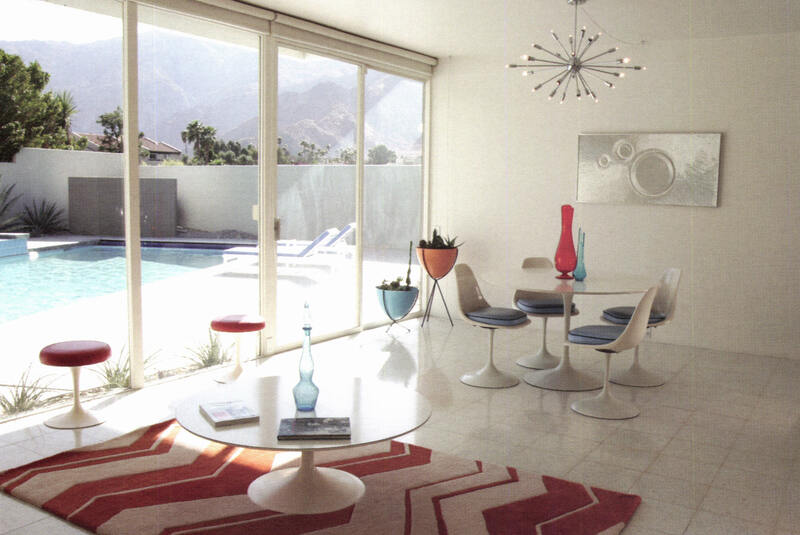 1971 - The Howard Richmond House, Rancho Mirage CA. Unbuilt. Commissioned 1969. 1972 - aka the Sagewood Condominiums, block encompassing East Sandalwood, North Sunrise Way, North Cerritos, and East Chia Road, Palm Springs CA. Project for Kaufman and Broad. 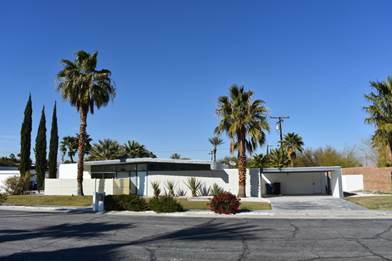 108 units with carports or shared garages, 3 bedroom/2 bath, 2 bedroom/2 bath. 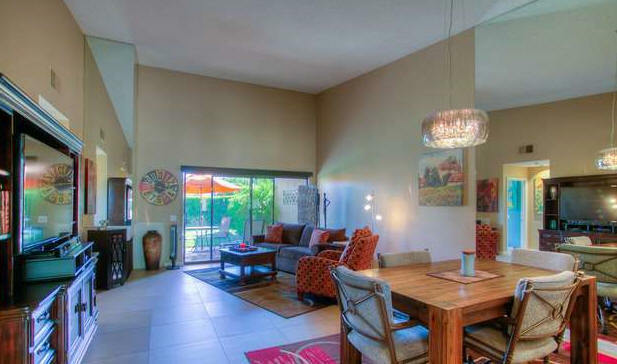 Representative unit, 2092 Sandalwood Drive, Palm Springs CA. 2 br/2 ba. Sold to Alan Hymowitz. Sold in 2015 to Jeffrey Acidera. 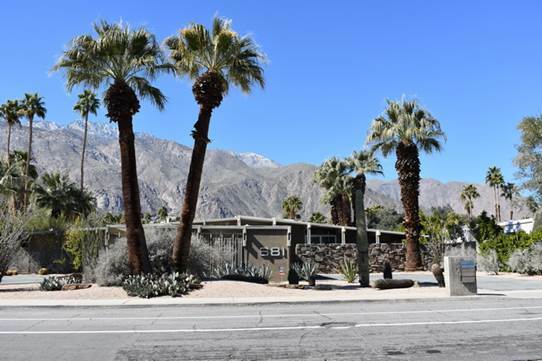 1973 - The Twin Springs Condominiums, 2696 South Sierra Madre, Palm Springs CA. 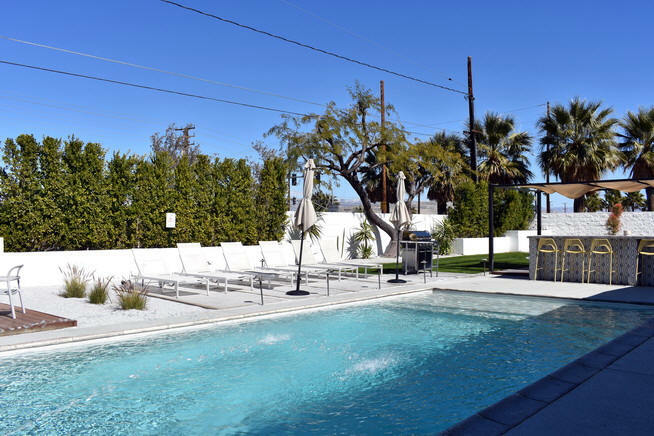 40-unit complex of 2 bedroom/2 bath condos. The original unit is still owned by its first owner, Sue Braun, as of 2015. 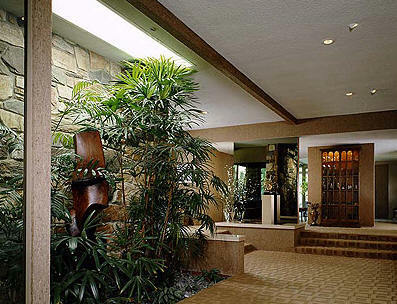 1977 - The Rancho Estates Condominiums, Vista del Sol, Rancho Mirage CA. Needs verification. 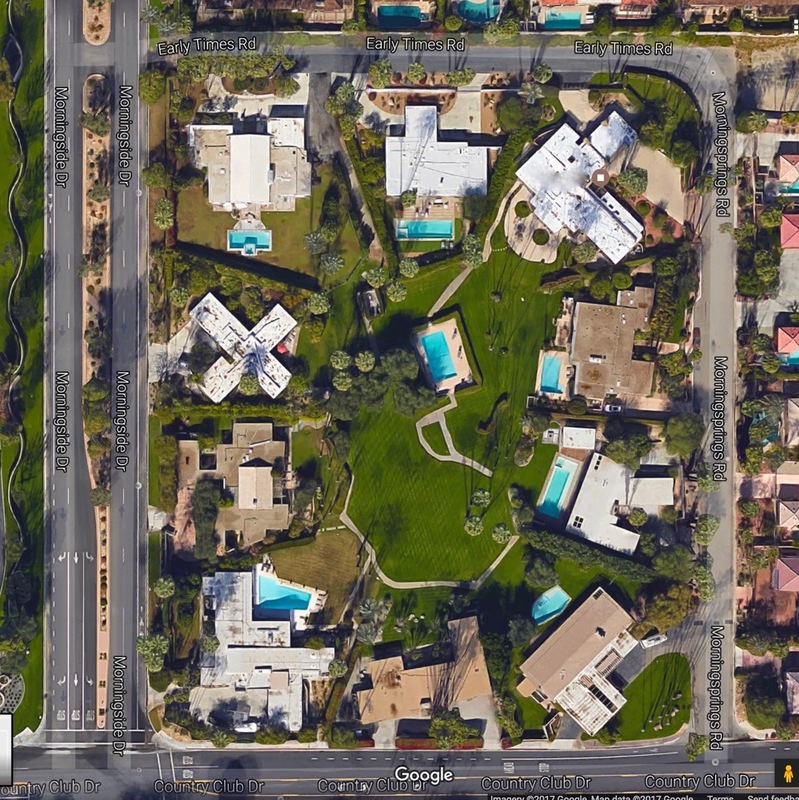 1979 - The Rose Garden Condominiums, East Baristo Road at Tiffany Circle, Palm Springs CA. 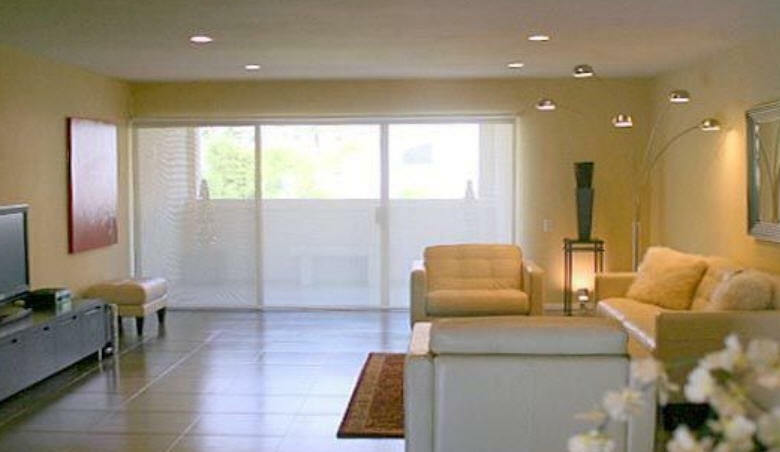 Project for H. Kassinger Development Co. Unit above is 1335 South Tiffany Circle, Palm Springs CA. 1979 - The H. Kassinger House, Thunderbird Heights, Rancho Mirage CA. 1981 - The Cecil P. Jones House, 899 Tamarisk Road, Palm Springs, CA. Wexler also did 1976 and 1981 additions. Still in the Jones family as of 2014. 1983 - The La Quinta Condominiums, La Quinta CA. Unbuilt. 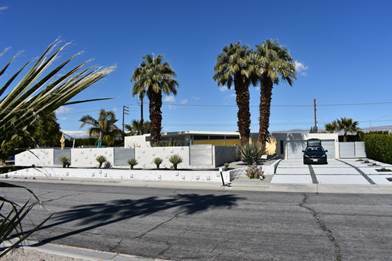 2003 - The Allen Miller/Tropicana Townhomes, 750-B Prescott Drive, Palm Springs CA. Sold to Neal Sabin in 2010. Commissioned 2001. 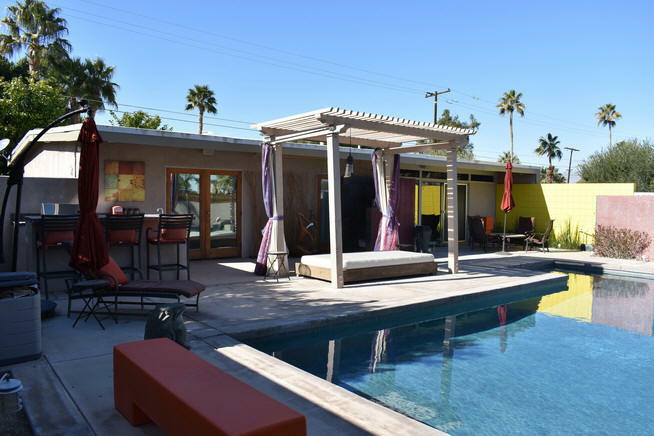 Four small post-and-beam homes in Old Las Palmas. 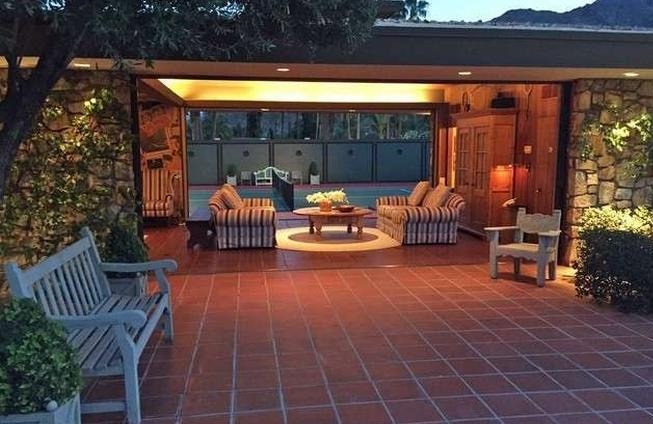 2007 - The Marc Sanders House, aka the Sanders/Krizman House, 1234 Verbena Drive (formerly 1234 Hermosa), Palm Springs CA. Commissioned in 2001. Located near Wexler's own residence. Construction took six years, during which time it was sold twice, first to Robert T. Butler, and in 2002 to Anne Krizman. Sold in 2011 to Tod Abrams. Sold in 2015 to Kim Kuehner. 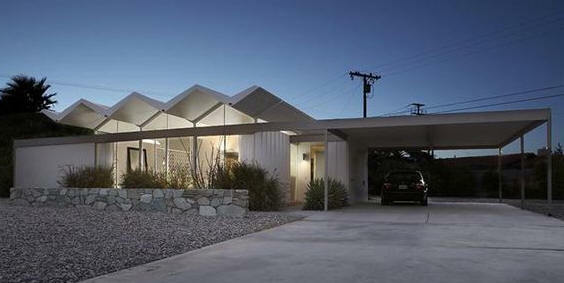 2008 - The Glen Wexler House, 3274 North Knoll Drive, Los Angeles CA. Designed for his son. For sale in 2018. Photos by Michael Locke. 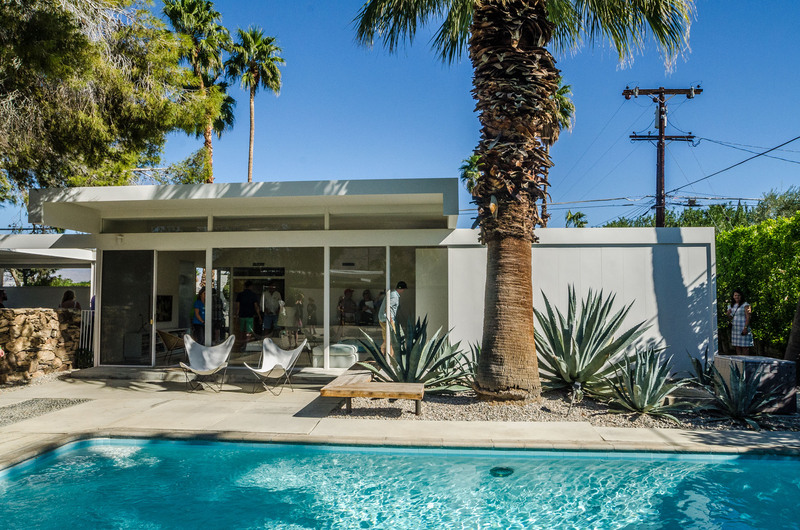 2015 - The Marc Sanders House, aka Steel and Glass 2015, 1155 East Granvia Valmonte, Palm Springs CA. Plans were drawn by Wexler and finalized less than two months before the architect died in June 2015. 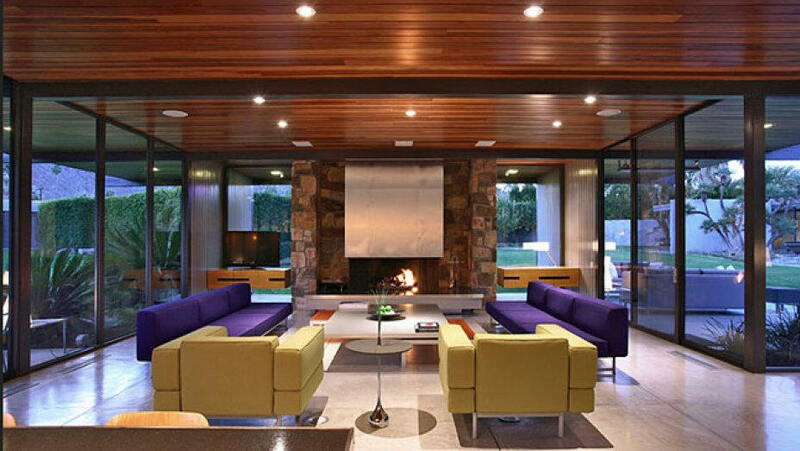 Designed with architect Lance O'Donnell. Built by Better Built Inc. Sold in 2016. Sources include: Morris Newman, Catherine Westergaard Cramer, psmodcom.org, City of Palm Springs Survey.